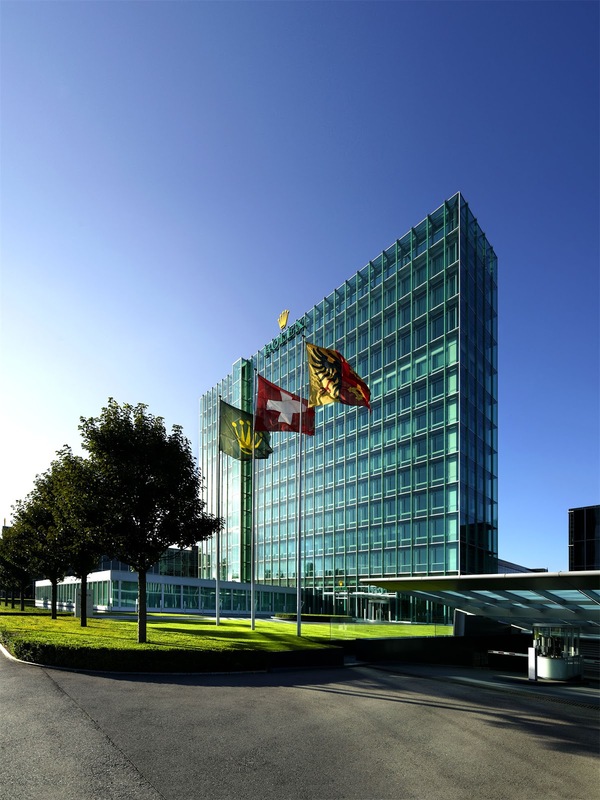 I had seen photos in the past of Rolex World Headquarters, and I realized it looked modern, but upon actually studying the inside design I discovered it was a true modern masterpiece of architecture. 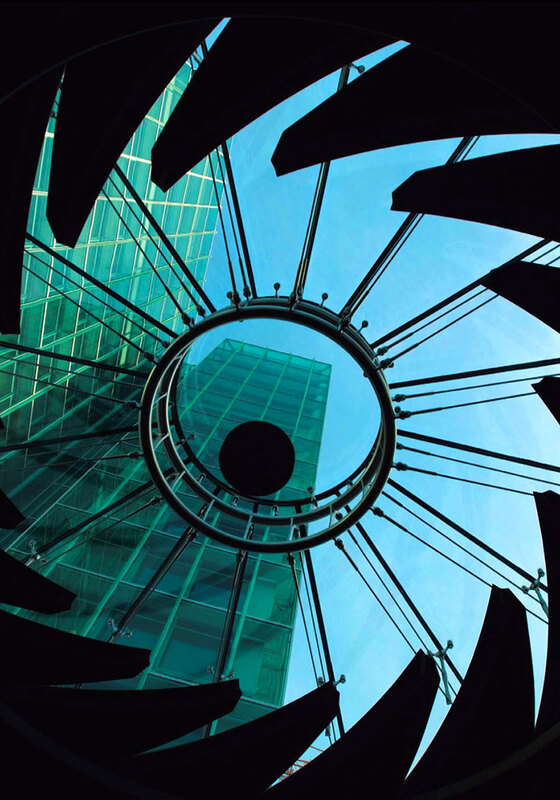 We began our Rolex World Headquarters tour in the indoor Rolex Amphitheater which has a glass ceiling that offers an upward view of the stunning Rolex Towers, as seen in the photo below. The sunray panels you see surrounding the round glass ceiling let in natural light that shows off all the amazing custom woodwork in the theater, and I noticed the pattern on the wood floor perfectly matched the ceiling design when the ceiling sunray panels are closed. After being welcomed, and receiving an overview of our upcoming tour, the sunray panels on the ceiling closed, to darken the theater so we could watch a video presentation on Rolex history. It was quite dramatic to say the least, and everything on all the Rolex campuses is designed just like a Rolex watch. All Rolex buildings and structures are stunningly over-engineered, with sturdy design and insides that are highly utilitarian, yet hyper-modern elegant. As you enter the Rolex theater you walk down a flight of stairs that has a beautiful bronze bust of André Heiniger, which kind of reminded me of the Hans Solo frozen in the carbonate refrigerator in Star Wars, except the André Heiniger bust was extremely elegant and tasteful, and had a beautiful bronzed finish. Why did I bring up Hans Solo? Everywhere we turned, there were details that made ALL four of the Rolex buildings look like they were out of a science fiction movie like Blade Runner, or Star Trek or Star Wars. After our briefing, we toured the adjacent buildings that complete all the final assembly, and boxing to ship out Rolex watches. 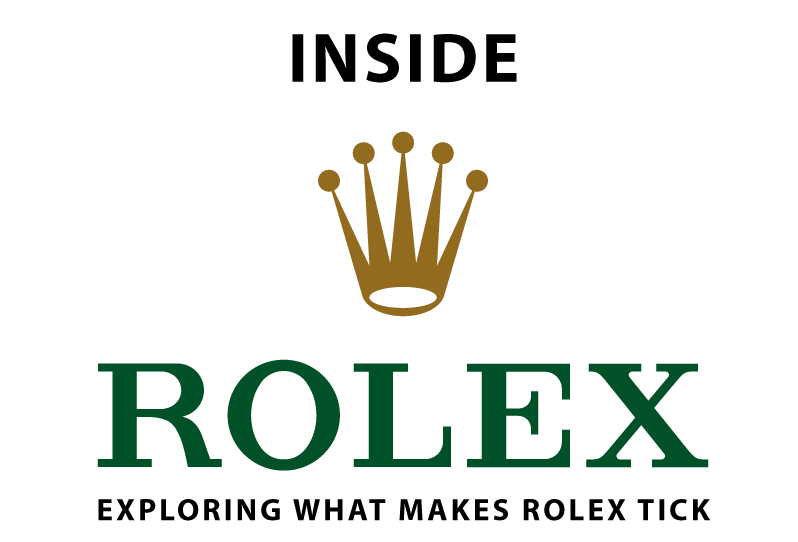 Rolex has always been a privately held company, that was fiercely independent and beholding to no one, and this is one of the unusual characteristics that makes it so dynamic and outstanding. It was so fascinating to be exposed to the part of Rolex that controls everything Rolex. 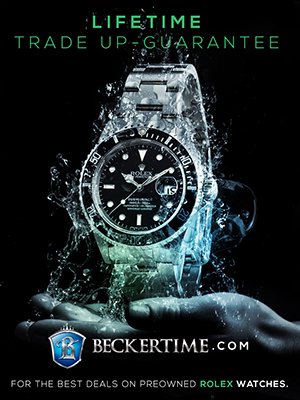 The executives at Rolex live and operate in a hyper-elegant world, which is completely timeless. After our morning tour we were invited to have lunch in one of the Rolex executive restaurants. The food was amazing and it felt like a true five-star restaurant. It also had a stunning view of Geneva, and I found the Rolex executives to be extremely engaging. Since we were the first group of online journalist to be invited to tour Rolex, it was kind of fascinating. It was like they were naturally curious about us, and vice versa. I believe in the past that Rolex frowned upon the internet and saw it as a threat to their world because everything is so instant. I think the Rolex torch has been passed–for the first time–to a new generation that, like myself has grown up with the internet, and understand the fact the world-wide-web creates an amazingly powerful showcase platform for Rolex. As they say, time will tell, but I was genuinely happy to see this new spirit of détente. After having lunch at Rolex World Headquarters, we traveled to Rolex's Plan-les-Quates facility, which houses their foundry, and it is also the factory where they make Rolex Oyster cases, Rolex bezels, and Rolex bracelets, as well as all aspects of finishing and final assembly. The Plan-les-Quates Rolex campus is enormous, and seems to go on forever, while being covered by dark grey Parsol glass. The structure consists of three wings, that have 11 floors, six of which are underground! 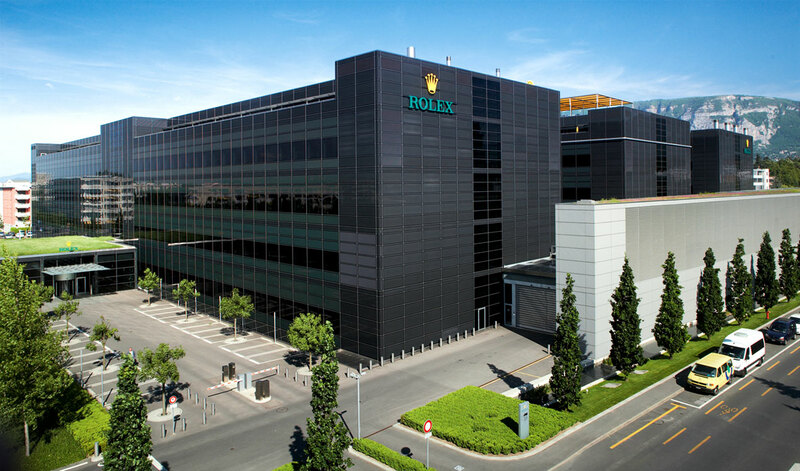 It took Rolex three years to complete this facility, which began construction in 2001, and were completed in 2004. 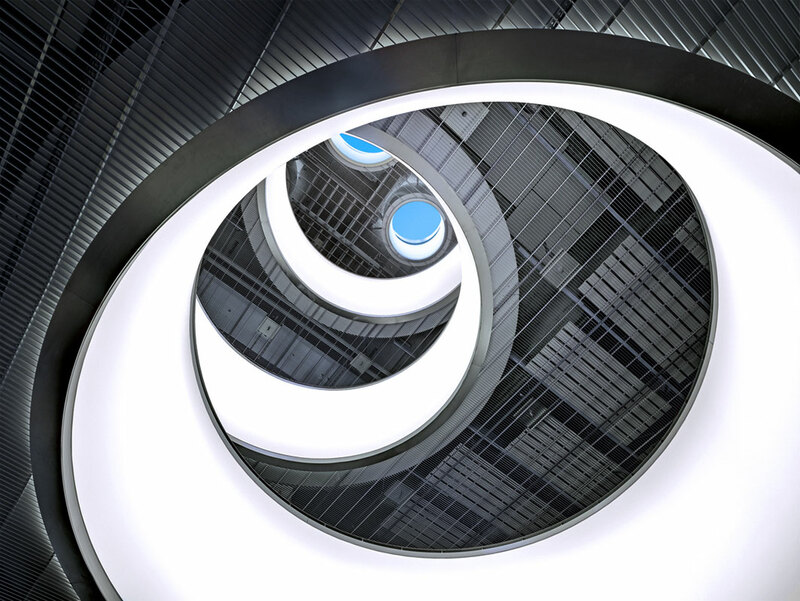 Ironically, one of the details that was most memorable to me about this facility, was how beautiful the elevators were. 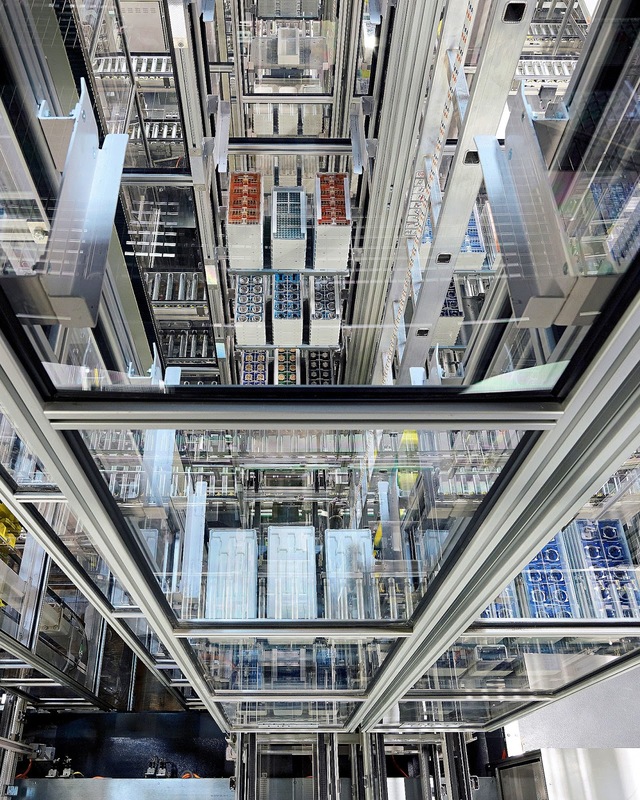 I know that sounds strange, but they were really super-high-tech, as were the elevators at Rolex World Headquarters. Also, this facility was right out of a James Bond movie, with retina scanners, and a ton or amazing technology. 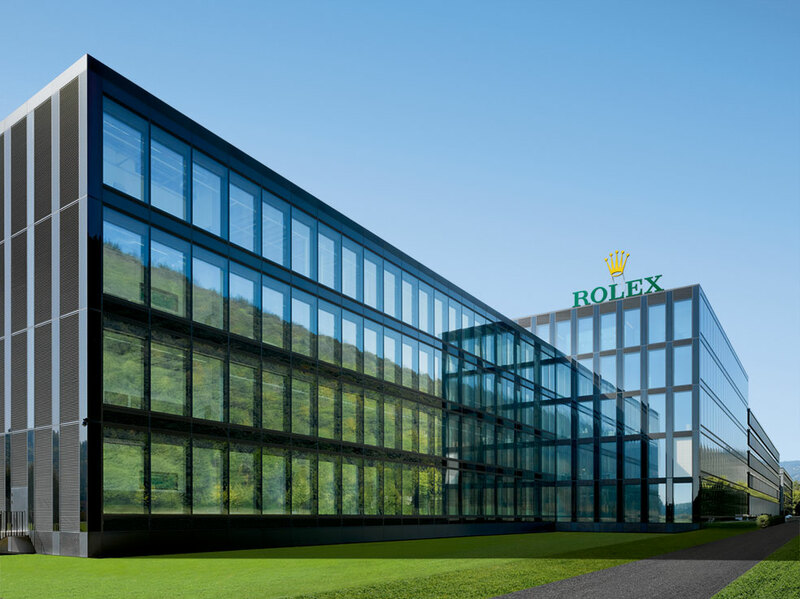 The Rolex Plan-les-Quates facility is built like an enormous Swiss Bank Vault, and rightfully so, since it is filled with a tremendous amount of precious metals. 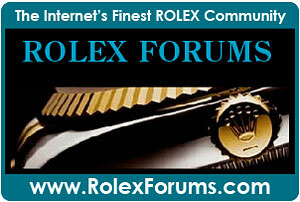 Ariel Adams, summed it up best when he said, "Fort Knox Has Nothing On Rolex." Of course the difference between Fort Knox and Rolex, is Fort Knox hoards gold, and Rolex turns gold and platinum into striking masterpiece watches. 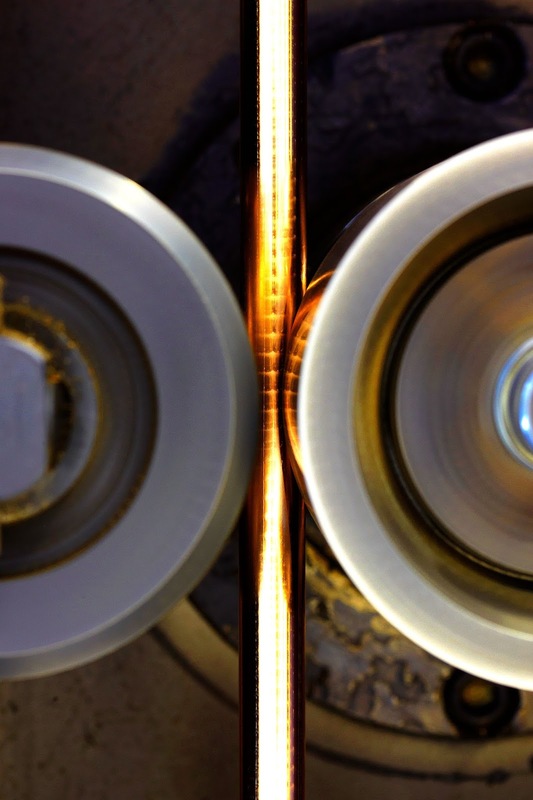 In the photo below we see the Rolex technician creating Rolex gold, by melting gold down to a liquid state so it may be molded into parts for making Rolex watches. 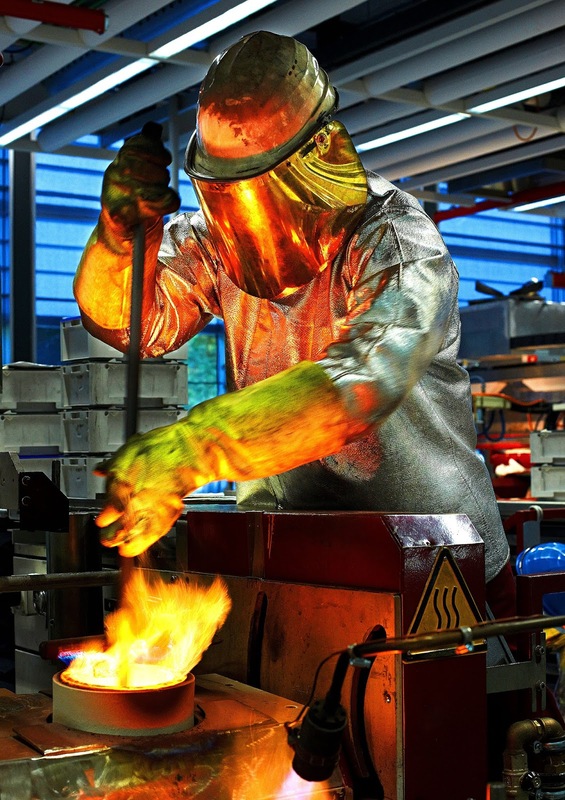 Rolex operates its own foundry which is super-state-of-the-art. 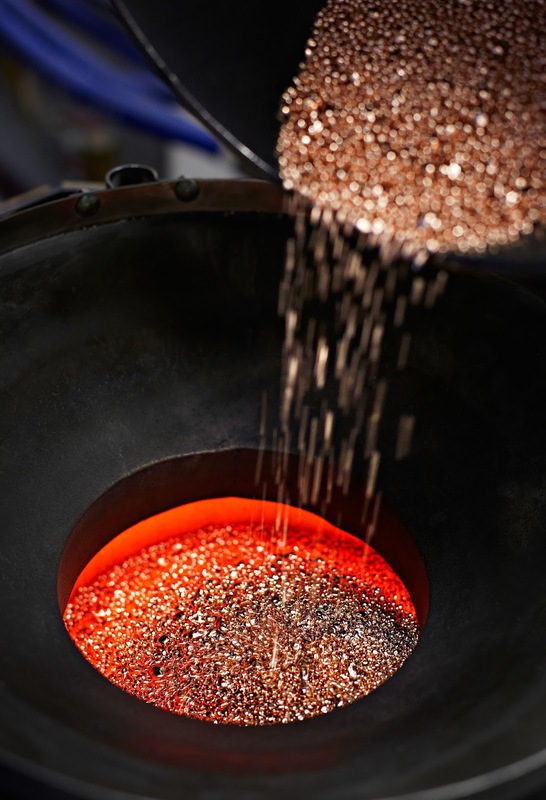 This remarkable foundry and advanced technological prowess allows Rolex to develop new and unique alloys like EverRose Gold which substitutes platinum for copper. 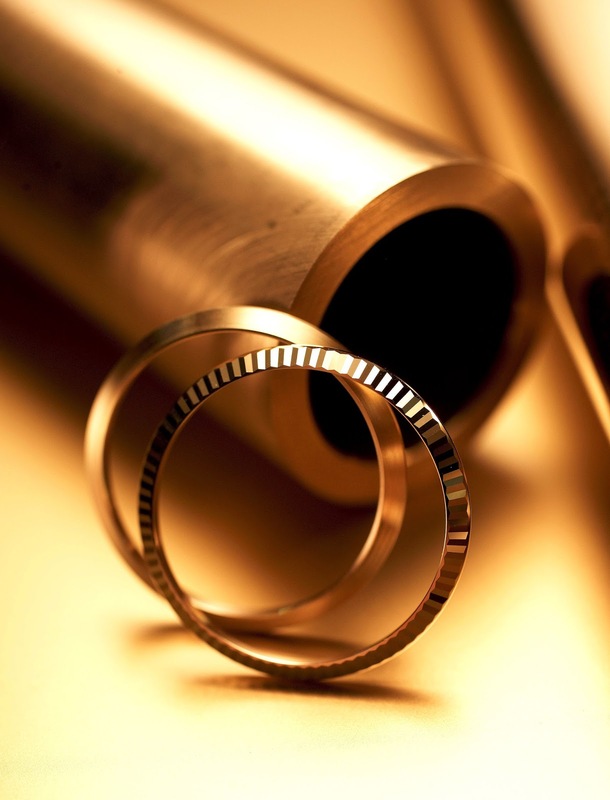 Rolex strives for absolute purity, which explains why they create all their own noble metals. 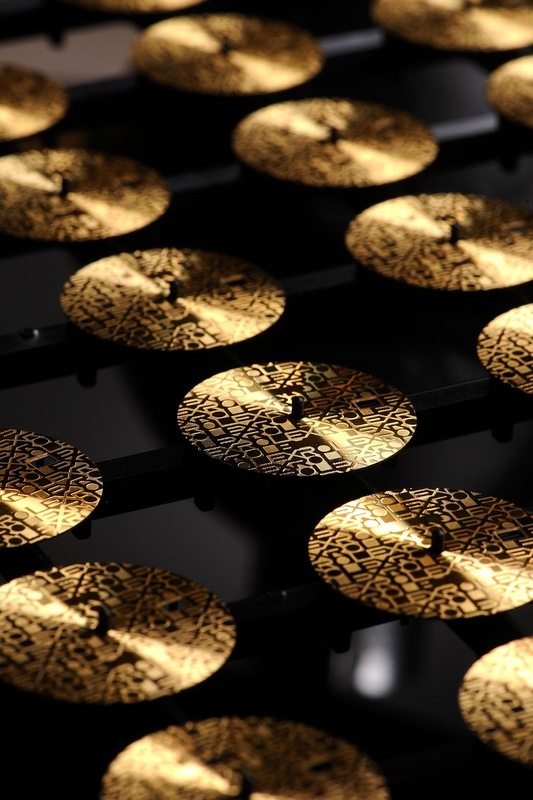 It is likely Rolex is the only watchmaker that operates their own foundry, and this fact goes to demonstrate how over-the-top obsessed and dedicated Rolex is about controlling and ensuring the outcome of the final product. 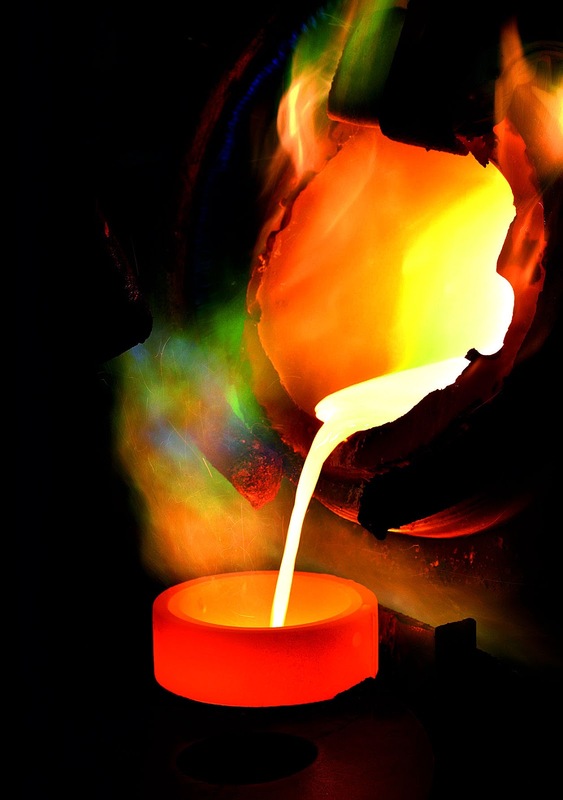 In the photos above and below we see molten gold being poured into a chamber for forming. In the photo below we see Role Everose gold pellets that have been created by Rolex. This process ensures the absolute purity of the Everose gold. Rolex specially developed Everose gold to overcome a challenge that typically affected red or pink gold, by decreasing the amount of copper content and replacing it with platinum. This is because copper will eventually tarnish (like a penny) and by replacing it with platinum, it counteracts this and ensures it will never tarnish. Below is a fascinating Rolex video that shows how Everose gold is made, in the Rolex factory. 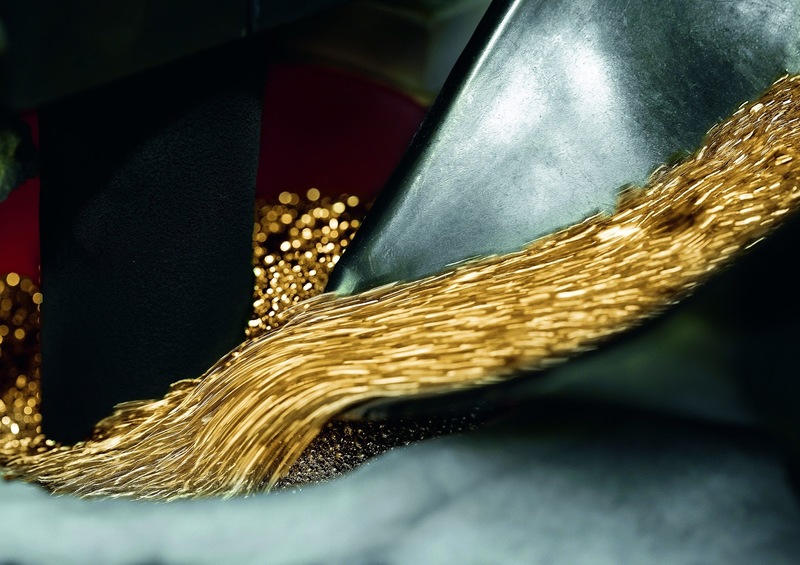 In the next photo we see Rolex yellow gold pellets being poured into a special tank so they can be melted again and transmuted into gold bars. 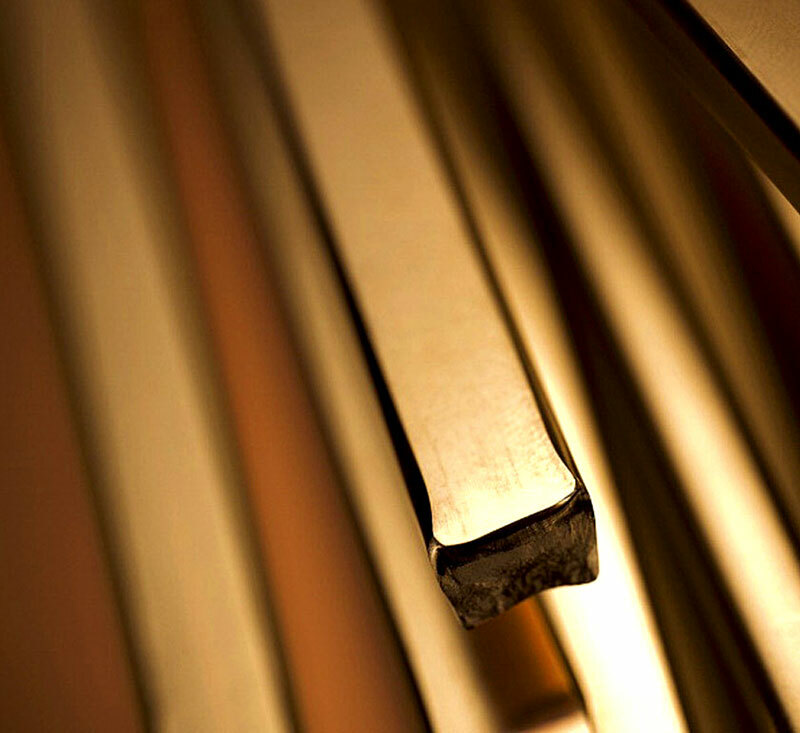 Below we see a photo of yellow gold bars made by Rolex. Rolex makes different size bars of gold for different size part. So for instance, the bars below may be made just for making Rolex bracelets clasps. 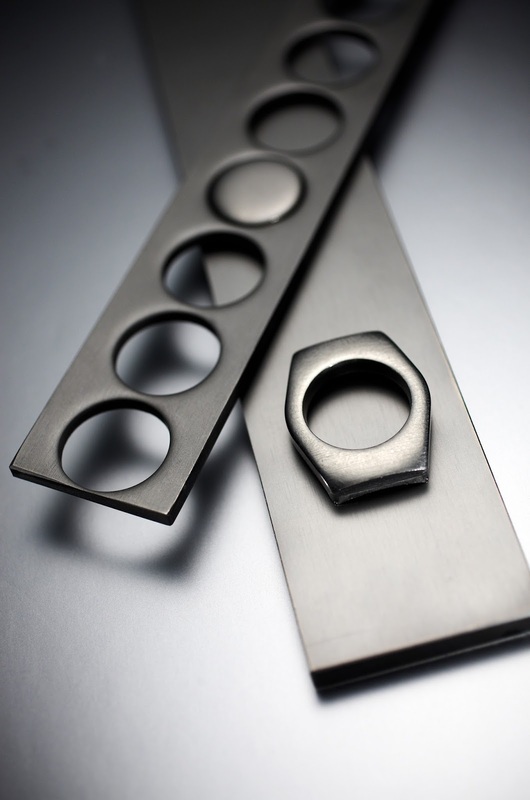 Some of the bars are finished before they are CNC machined into parts for making Rolex bracelets, as seen in the photo below. The photo below shows a raw Rolex Oyster case that has been stamped out of a solid piece of noble metal. Rolex only uses the absolute finest raw materials for making their watches, and they are renowned for going to extremes in their passionate pursuit of excellence. 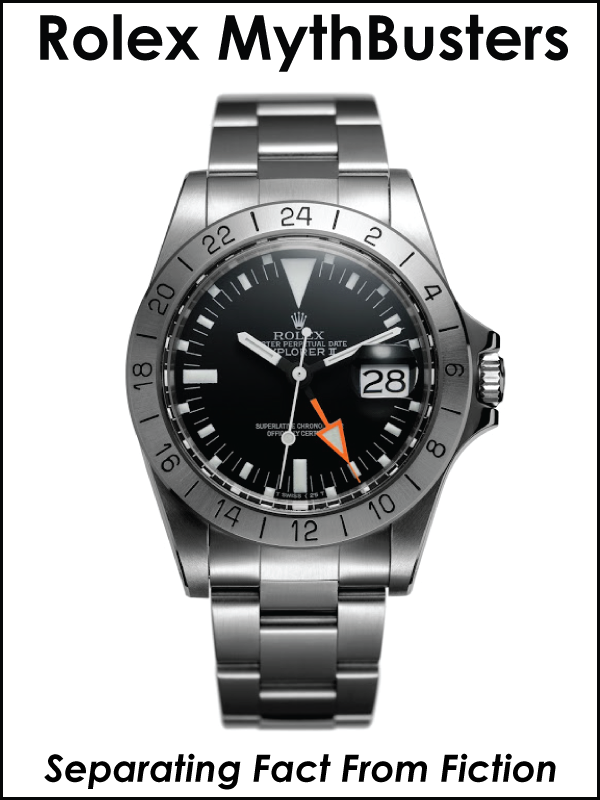 For instance, the stainless steel used in all Rolex watches is not plain-old, regular 316L stainless steel. 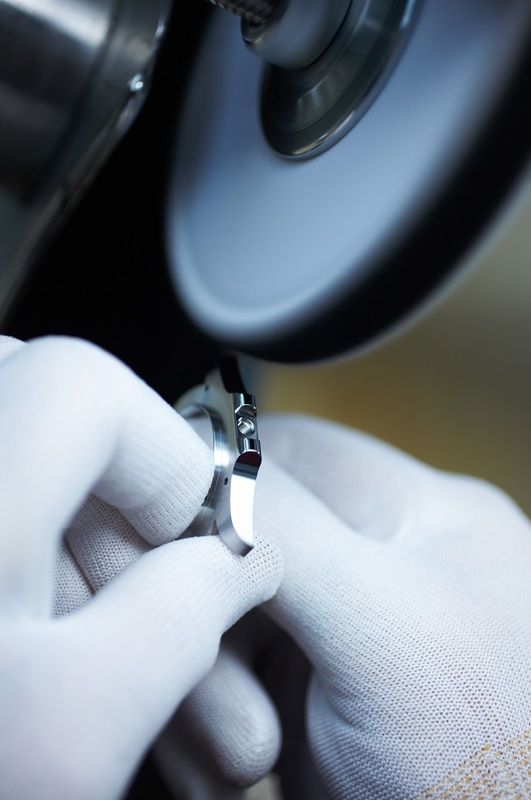 Most fine watch manufactures use a grade of stainless steel known as 316L, which has a Rockwell B hardness rating of 90-95, which is very hard. 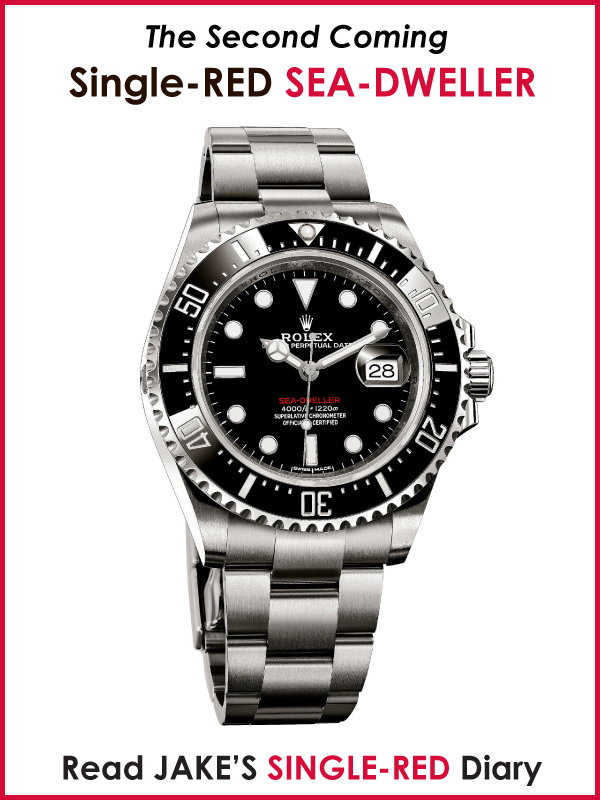 Rolex instead uses a stainless steel known as 904L, which has a Rockwell B hardness rating between 70-90. Rolex uses 904L instead of 316L because despite the fact that 904L may be a little bit softer, it is possesses much greater corrosion resistance characteristics. 904L is more difficult to machine, so Rolex had to invent new machines for doing so. 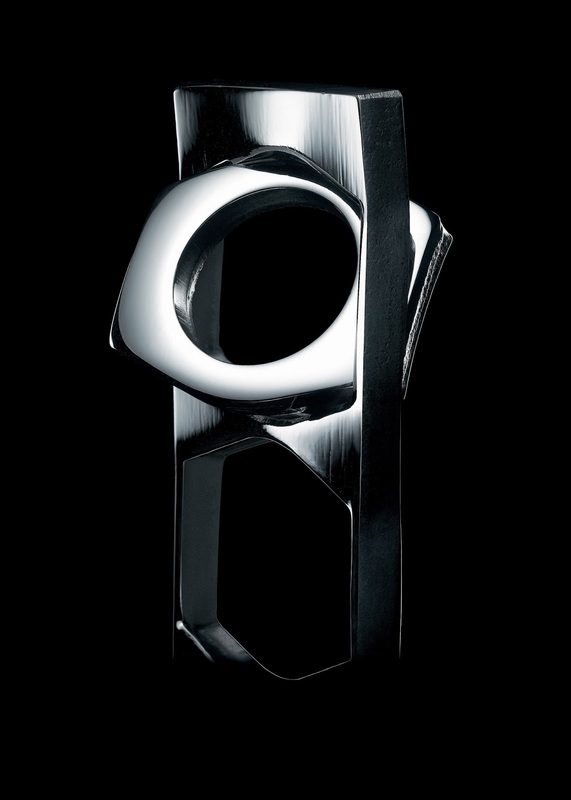 Rolex refers to the grade of stainless steel they use as a "noble metal", since the grade they use is so pure. When we were in the foundry, Rolex showed us raw bars of Everose gold that had just been made, which would be used for making Rolex Oyster cases. These bars were about 2 feet long, by about 3 inches, by about 1/2 inch thick. 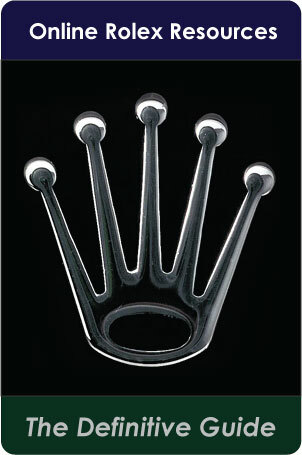 The photo below shows a similar Rolex bar which could be stainless steel, white gold or platinum. It illustrates the size of the Everose bar we saw, and how the Rolex Oyster cases are stamped out of the bar. So the Everose bar we saw had not had Rolex Oyster cases stamped out yet, and it was about the length of the one pictured above. We each picked up the bar to see how heavy it was, then we did some basic informal math and realized there was about $1 Million dollars in gold just in that bar alone. When I picked it up, it was amazing how heavy it was compared to how heavy it looked. In other words it was much heavier than it looked, and I started doing curls with it. My best guess is that it weighted about 50 pounds. Crazy!!! James Dowling pointed out the fact the single bar was worth more than a standard nice house. I mentioned it San Francisco, it would get you a single bedroom Condo, which is still fascinating. In the photo below we see a photo of a tube of Rolex yellow gold that is used to make fluted bezels for the Rolex Day-Date, and Datejust. 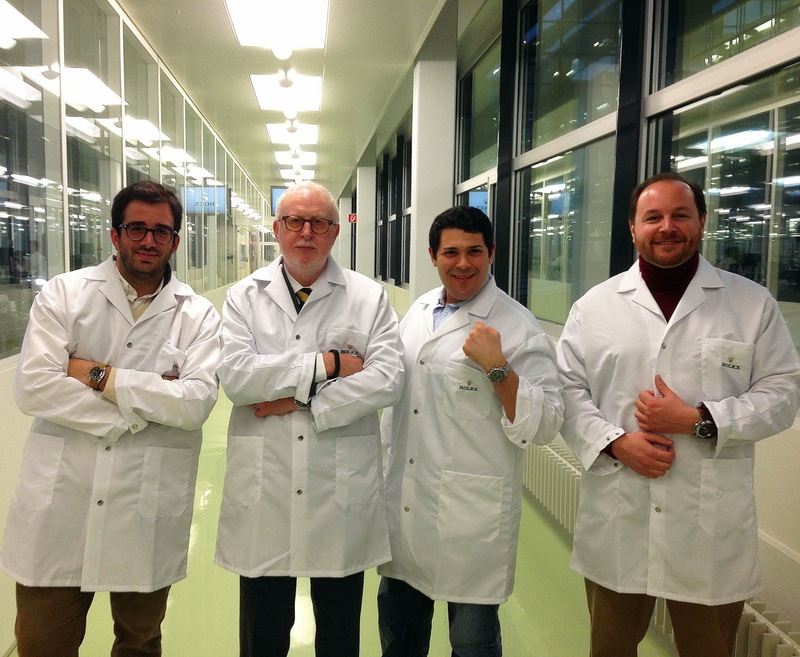 Rolex factory representatives took us on a tour of the section of the factory that specialized in making bezels. They walked us through every step of how they make the Ceramic Bezel inserts, which Rolex refers to as Cerachrom, which is based upon a patented Rolex process. 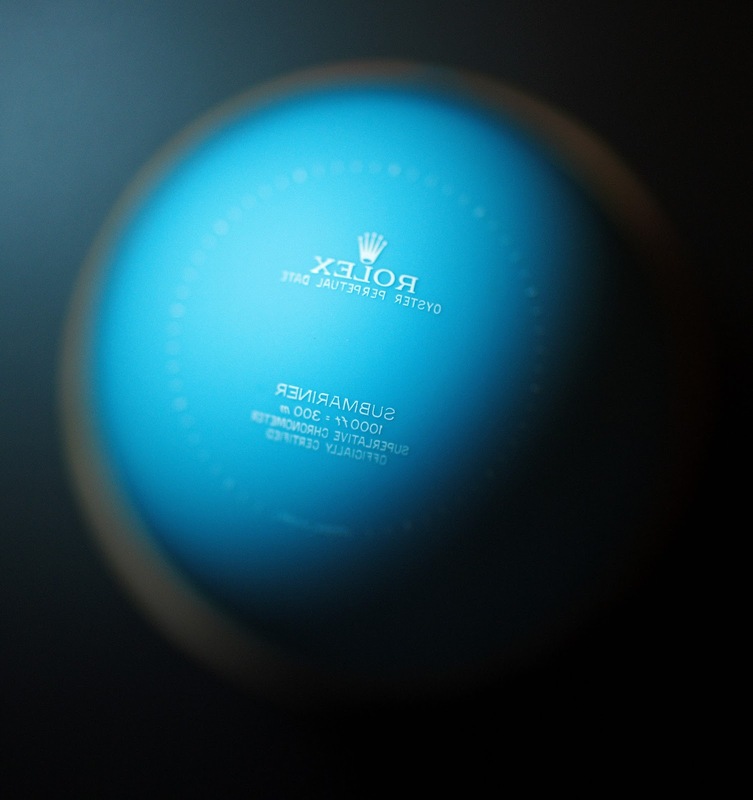 Rolex begins with a piece of special type of ceramic material that looks like clay. 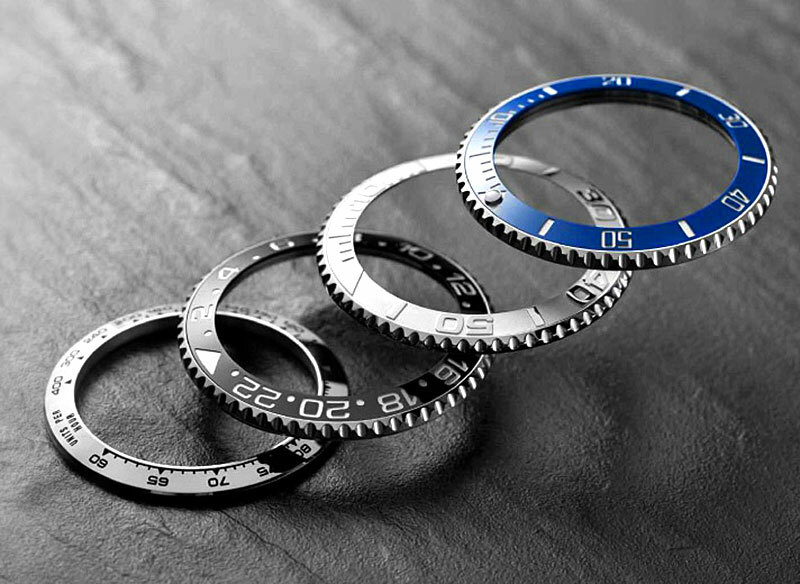 Then they stamp the initial bezel, but when it is done it is about 35% larger than the finished bezel insert. Next, Rolex puts the clay in a special oven that heats it up to 1500 degrees, which hardens and purifies the ceramic, which then perfectly shrinks the bezel down to the actual final size. Next Rolex bombards the remaining disc with a PVD process that covers and coats the number channels and the entire disc with 18 KT Yellow or White Gold. Then they polish off all the gold on the surface of the ceramic bezel, and the number channels remain filled with gold. The video below offers a high-level overview of this process. Watching the entire process of the Rolex Cerachrom Ceramic Bezel inserts being made blew my mind. In particular, I was shocked at how they could heat it up, and predict with perfect accuracy, exactly how much it would shrink. Rolex used to use aluminum bezel inserts that were anodized with color, and less than a decade ago, Rolex switched over to Ceramic since Ceramic is much, much sturdier, and it won't scratch or fade over time. 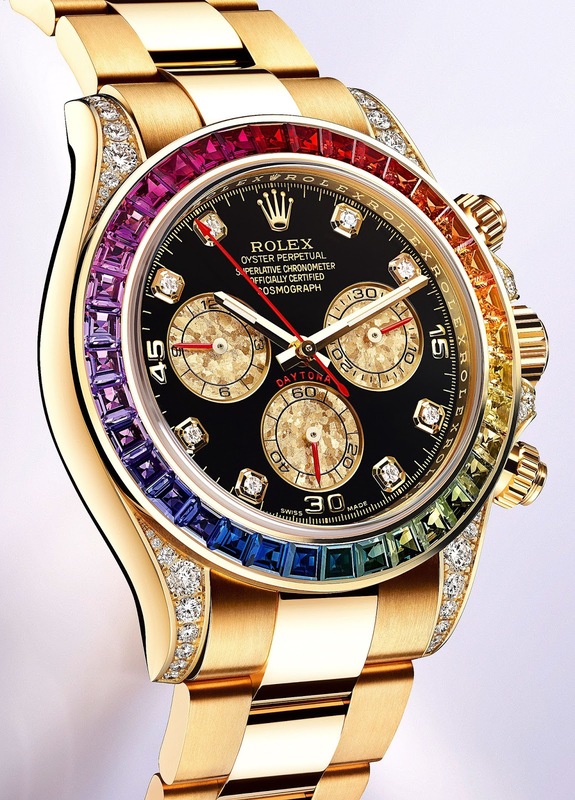 In other words, it will alway look new, and just like the synthetic sapphire crystals Rolex makes, they are so strong, they will shatter before scratch, and the same is true with the Ceramic bezel inserts. 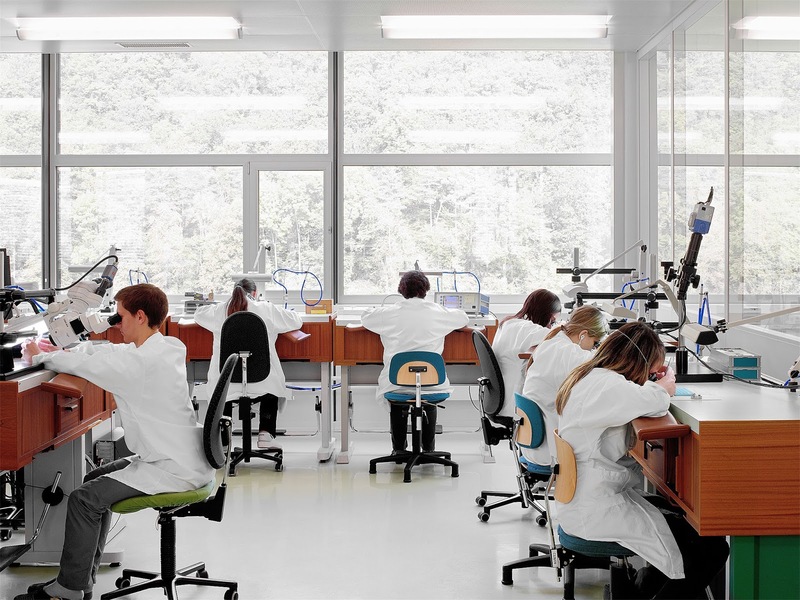 The photo below shows Rolex workers at the Plan-Les-Quates facility hand assembling Rolex Oyster and Jubilee bracelets. Once again, I was surprised to learn how much hand assembly work goes into assembling Rolex bracelets. For some reason, I assumed they must be assembled by robots, but that was not the case. Instead, they are all hand assembled in such a manner that requires much skilled handwork. 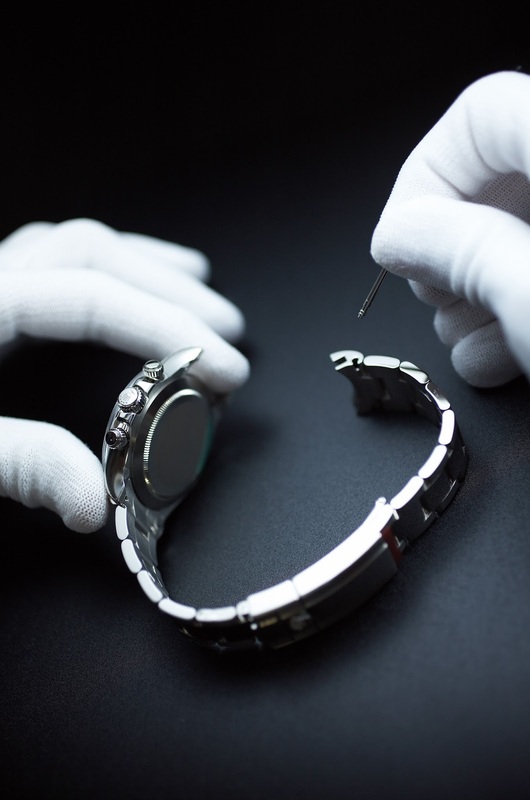 The photo below shows a proprietary Rolex tool being used to assemble a Rolex Oyster bracelet. The photo below shows a freshly made Rolex two-tone Jubilee bracelet, with the hidden invisible clasp. As I mentioned earlier, I was shocked to learn how much hand-finishing work goes into each and every Rolex. It was almost kind of bizarre, how many finishing and assembly steps there are that are done by hand, and I think this is likely one of the things that differentiates Rolex. From what I saw, Rolex seems to incorporate a great deal of love and caring in each and every Rolex they make. 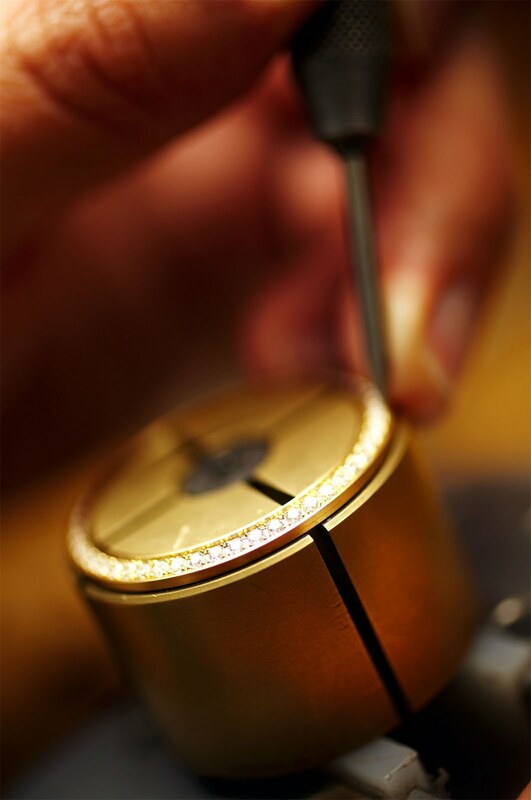 The photo below shows a Rolex sport watch middle-case being hand-polished. The photo below is not from a science fiction movie, although it really looks like it is. The world of Rolex landscape often looks more like the set from Star Trek, Star Wars or Blade Runner–complete with double glass doors that instantly slide open while making the Star Trek "swoosh" noise when you approach them. There are hallways that seem to go on infinitely, and I kept expecting to see some of those robots from the Death Star that look like little robotic vacuum cleaners traveling down the hallways, or Luke Skywalker and Hans Solo in white plastic Stormtrooper costumes from Star Wars walking with Chewbacca the Wookie down a hallway but unfortunately I did not see anything like that. The reality is that all four Rolex campuses are equipped with otherworldly over-the-top, super state-of-the-art technology that is awe-inspiring and completely mind-boggling!!! All the elevators in this facility have glass on all four walls, and operate in all glass elevator shafts, so as you move up and down, you have a real sense of movement. I would say the single funniest moment of the tour was when we were walking around in the Plan-les-Quates Rolex facility, and James Dowling, Ariel Adams and Benjamin Clymer and I were all completely freaking-out on how over-the-top James Bond/SciFi everything was. Our Rolex guide mentioned we would next have to go though a successive set of doors that would close behind us before the next one opened, and among other things, they had to authenticate using their retina, James Dowling cleverly quipped: "If a man appears in a Nehru jacket appears with a white cat, I am out of here!" Everybody in the group responded by laughing hysterically–halfway because it was so funny, and halfway because it was true. 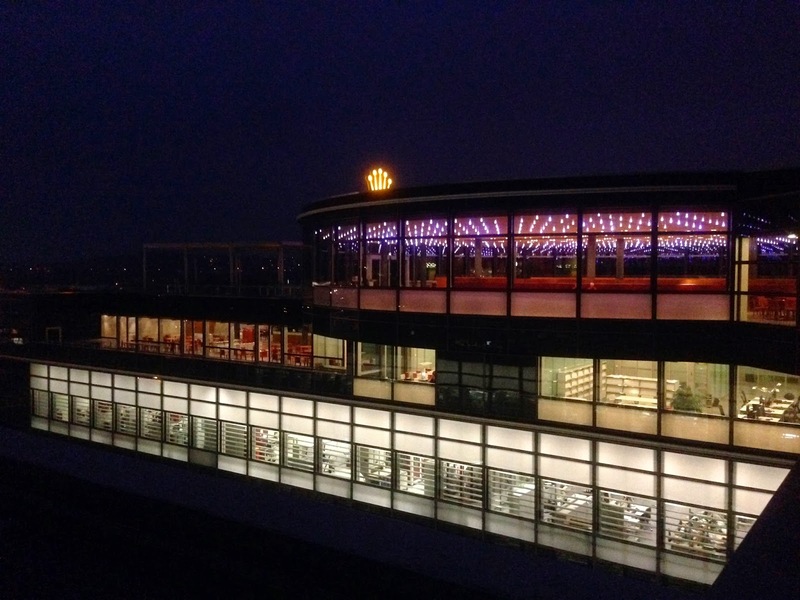 I took the photo below at night that shows the Rolex cafeteria located on top of the building, and it was much, much more like a beautiful gourmet restaurant. As I just mentioned, many parts of the Plan-les-Quates facility looked like they were straight out of a James Bond movie, complete with iris scanners, that were redundant with special security ID cards that let Rolex employees through doors that are thicker than a foot. When a Rolex watchmaker requires parts, they simply order them up, and the Rolex automated delivery system will deliver the parts directly to their workstation typically within minutes by utilizing this unbelievably complicated and dependable system. 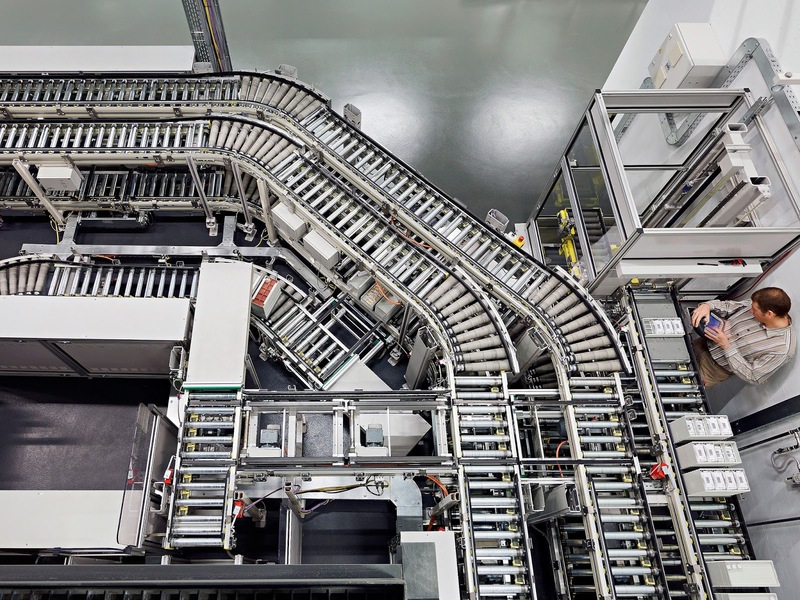 When each Rolex watchmaker or assembly worker arrives at work, they log in at their work-station, this robotic system automatically moves all the parts they need in bar-coded trays to them. The tray are all stored in a redundant subterranean vault system, which requires each worker to install their ID card and do a fingerprint scan at their workstation to recall the trays they left off with from the day before. This system ensures absolute accountability and accuracy. 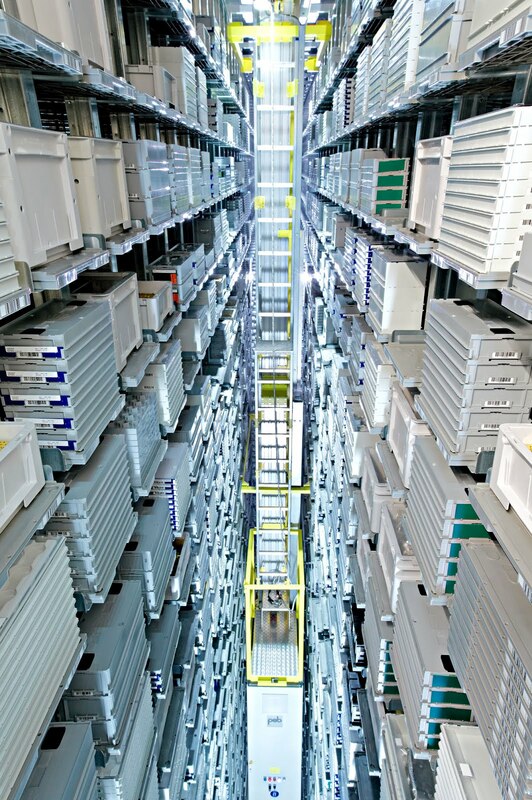 The ceilings in the automatic storage system are 40 feet (12 meters) high. Just to be crystal-clear, there is an ultra-secure main storage vault where 100% of all the working materials and parts are stored overnight in an underground vault system. 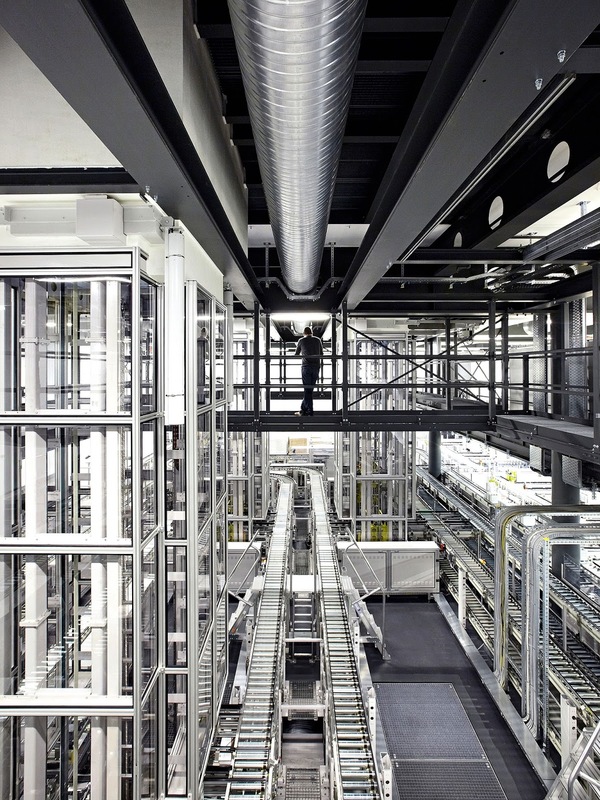 When the worker checks-in from their workstation, the highly robotic automated system, pictured above and below, moves high-speed miniaturized elevator systems on a quickly-moving track to the exact location where the parts trays are stored, and slides them onto the elevator, where they are lowered down to a specialized conveyer-belt system that transfers the parts through a system of additional elevators and conveyer belt systems to the workers workbench. Rolex also showed us an illustration of their Subterranean vault system where they store all their precious metals, and raw material, including more parts. They explained how it featured a redundant system so if the main system ever failed, it could not slow-up production. Of course, we asked if they ever had a system failure that required them to use the redundant back-up system? The Rolex representative, confidently smiled at me, and gently shook her head back and forth sideways, and said: "No. Our system has never failed, but it is nice to have the piece of mind to know if one system ever failed, we would stay online." Basically Rolex robotic systems are designed exactly like a Rolex watch. They are robust teutonic, refined and efficient, and they told us the whole system was designed by and runs on an SAP system. "Some may call it an obsession. 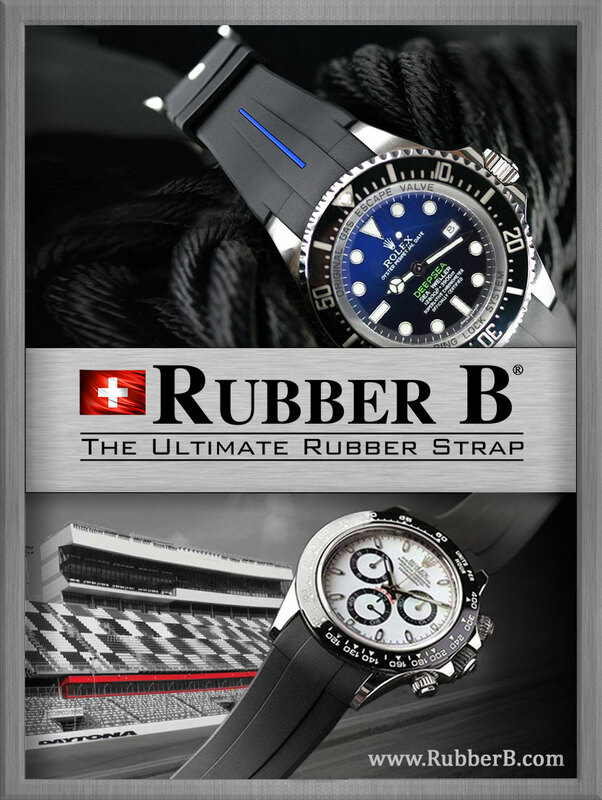 At Rolex however, the pursuit of excellence is a passion." 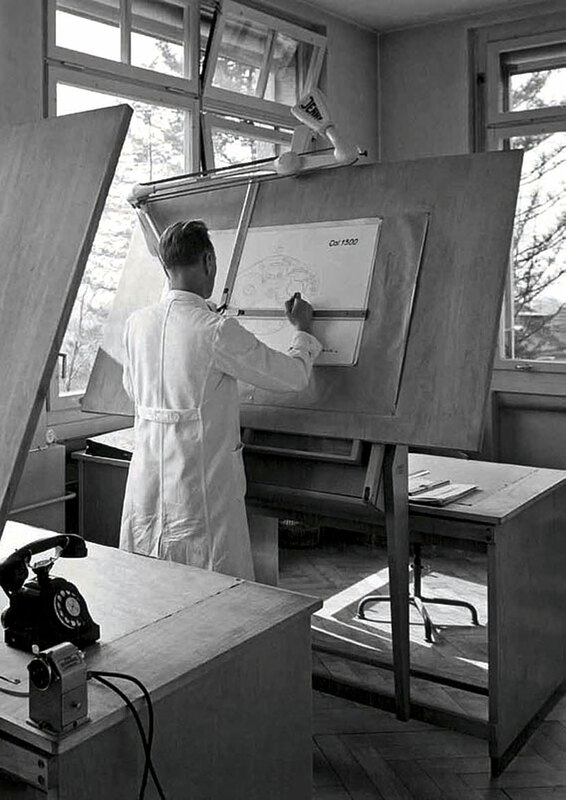 At Rolex there were testing stations everywhere for measuring the accuracy of just about everything. 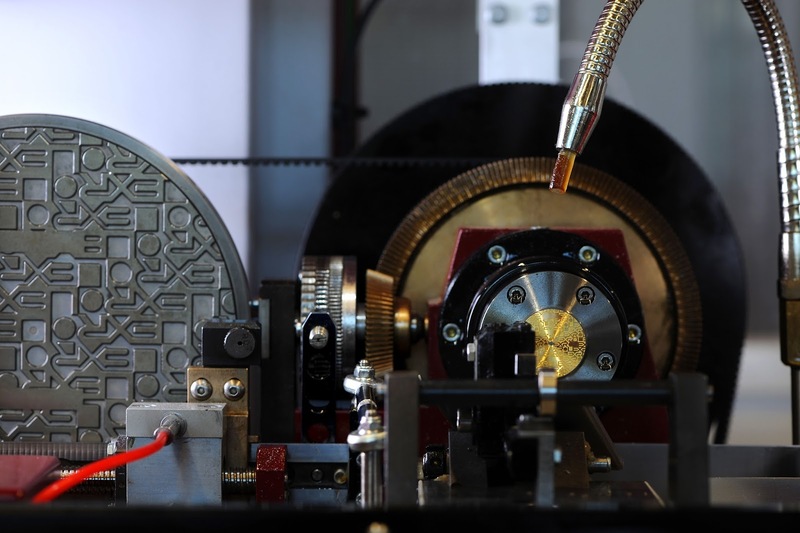 Rolex had a special laboratory that just did heavy-duty stress testing on parts and watches to make certain they would never fail when in the hands of or on the wrists of customers. 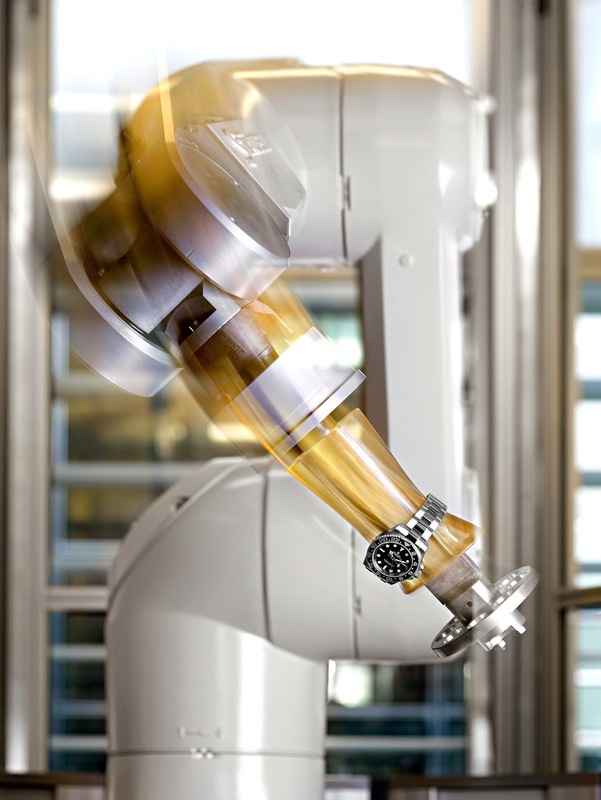 The photo below shows one such Rolex testing machine that is measuring movement of the GMT-Master on a simulated fast-moving robotic wrist. We also visited a department that used electron scanning microscopes which were insanely powerful. Being able to measure materials on an super-powerful microscope allows them to figure out all kinds of crazy things, that the human eye can't see. Rolex's labs looked like something out of the X-Files. 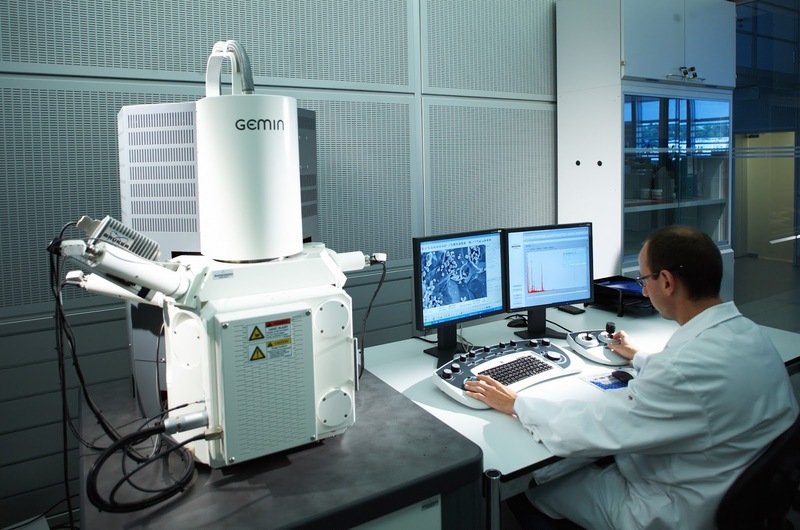 The photo above shows a Rolex technician working with an electron microscope, and we learned that in order for these super-powerful electron microscope to work properly, they need to be located on a ground floor, so they can't move at all. In other words, typically you couldn't use one of these on any floor in a building except the bottom floor, because minute vibrations in the building structure would cause the microscope to get not work properly. The Rolex building was so stable, and reinforced so intelligently, they had their lab on one of the top floors. On the morning of November 19, 2013 we traveled to the Rolex facility located in Chêne-Bourg, Switzerland, which specializes in dial-making as well as making watch hands, bezels, crystals and gem-setting. The Rolex building structure at Chêne-Bourg is a magnificent work-of-art that is 5 stories tall. This structure came on-line in 2000, and took two years to build. 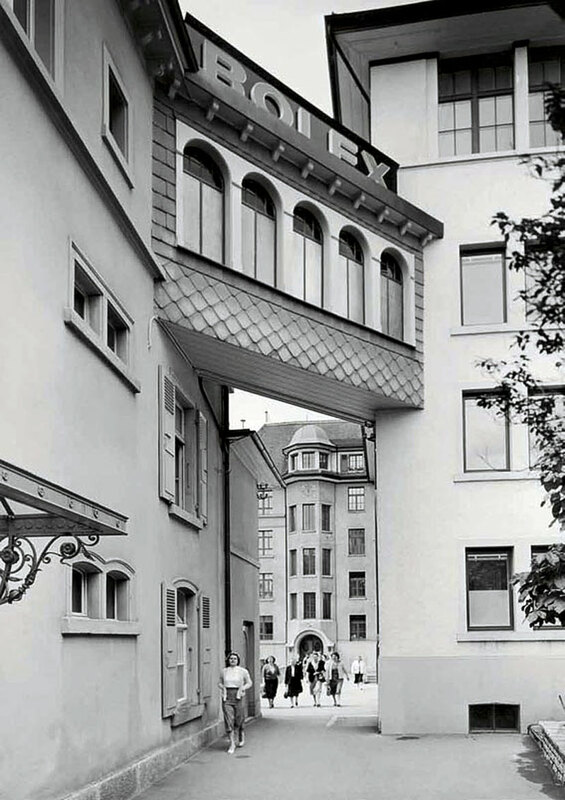 It was the first building Rolex completed under then CEO, Patrick Heiniger's leadership, as part of the consolidation. 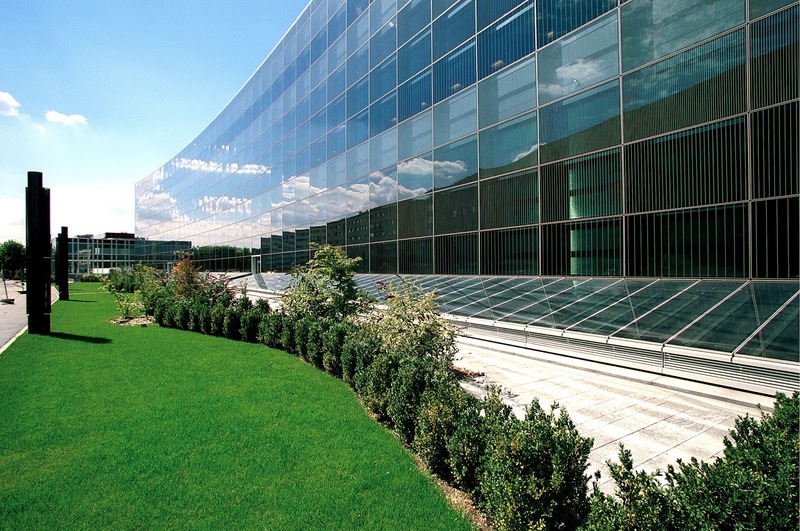 All Rolex buildings today are covered with glass, which significantly increases energy savings, while providing a great deal of natural light for workers. I have talked a lot about how bold, outstanding and innovative Rolex building architecture is and this is really an understatement and not always easily apparent. The Rolex Dial and Bezel Facility located at Chêne-Bourg is a great example of how innovative Rolex structures are. The Rolex Chêne-Bourg structure is like a huge sky-scraper, turned on its side, so as you see in the photos above, the building is very long, and it slightly curves to accommodate its environment. There is another incredible design feature that is not initially apparent to somebody examining the structure from the outside, or from a photograph. This amazing building has 2.5 ultra-tall subterranean floors which are not visible, and the most amazing detail is if you look closely at the photo below, you notice there are large panels located at the base of the building that look like they might be solar panels, but they are a skylight system, that delivers natural light to the 2.5 subterranean floors. The 2.5 floors below ground, are not normal height floors. Each one we visited had ceilings that seemed like they are around 30 feet high, yet in the daytime, they were bathed in natural light, which gives workers the sense they are above ground, and stops them from ever feeling claustrophobic. I have never seen architecture like this before, and it obviously really impressed me. 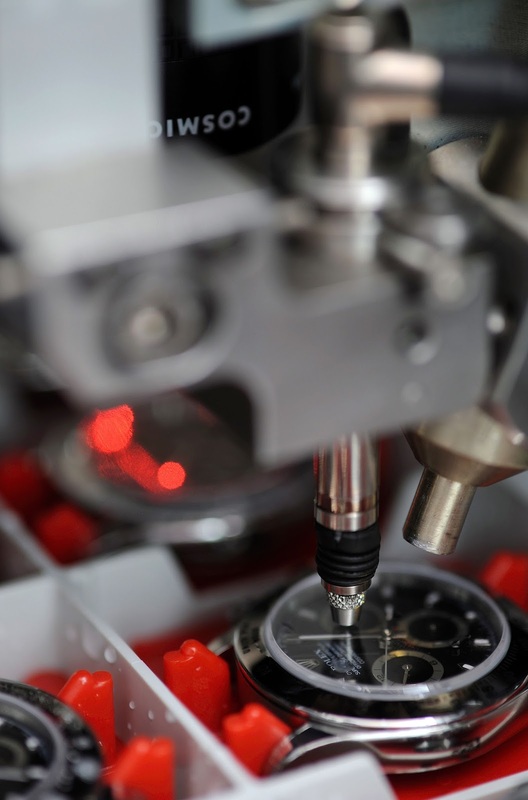 Rolex makes watch cases and bracelets, as well as all parts with CNC machines at the Chêne-Bourg facility. Once again, I was surprised and impressed to learn all parts are still hand assembled by Rolex trained master watchmakers. The ladies floral blue Rolex dials pictured below are PVD coated, which give them a stunning appearance, and seeing this process was remarkable. We had the opportunity to observe how Rolex makes its Guilloché dial, which are an absolute work-of-art, in-and-of-themselves. Guilloché is an age-old super-precise decorative engraving technique that mechanically carves a beautiful repetitive pattern. The result of which you can see below, which makes these beautiful Guilloché dials for Rolex Datejust watches. 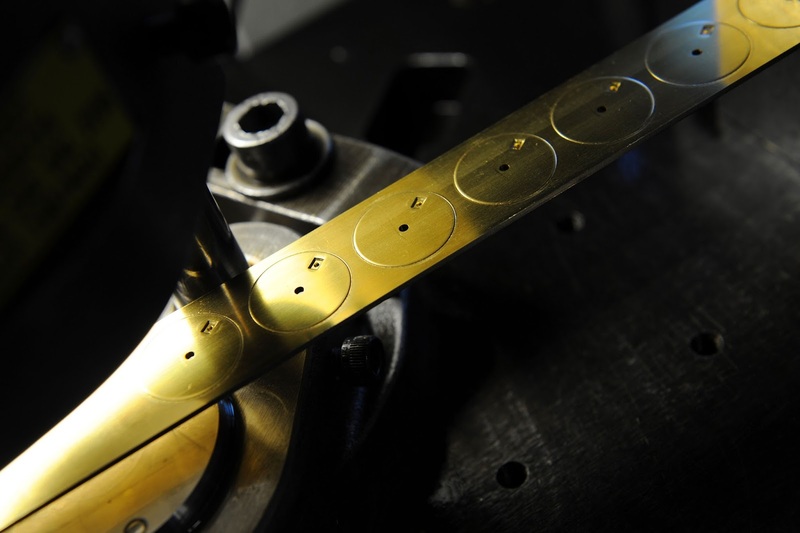 In the photo below we see the Rolex dial Guilloché process taking place. 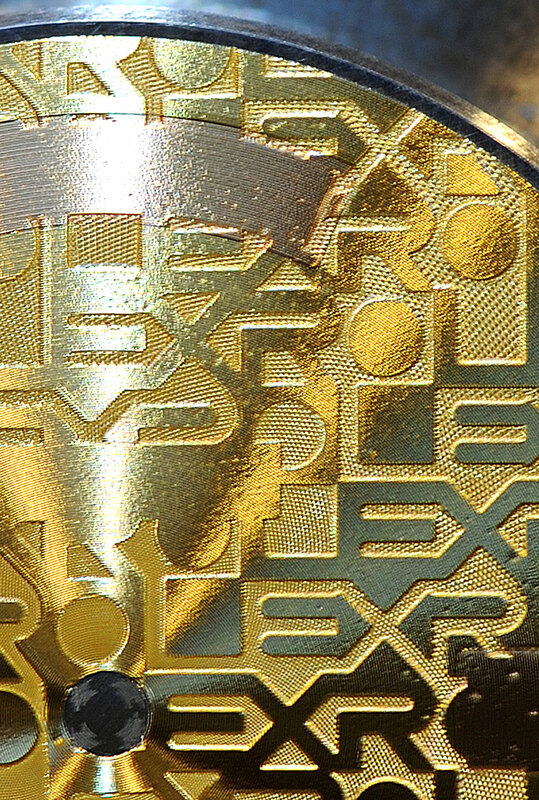 The way it works, is the Guilloché master engraving disk is located on the left side in the photo below, and it has the master pattern that is being engraved in miniature scale on the gold Rolex dial which we see located on the right side in the center of the apparatus. 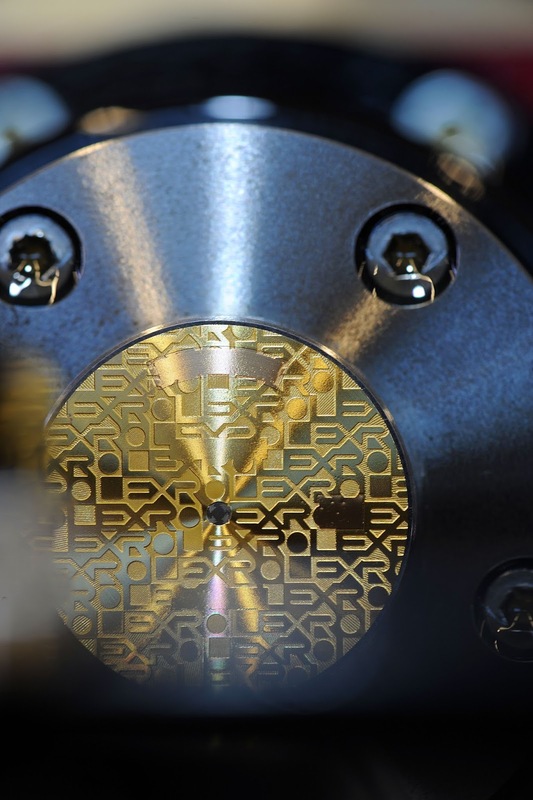 Rolex explained to us that there is not a computerized CNC method that can achieve this same magic process, which the Guilloché can. In other words, you would think this could be done digitally, and Rolex told us it cannot be done digitally, which explains why they still produce these specialty dials in an old-fashioned method. In the photos above and below, we see the tremendous level of detail that is achieved with the Guilloché turning machine. We also got to see how all the Rolex dials are hand assembled at the Rolex Chêne-Bourg factory. 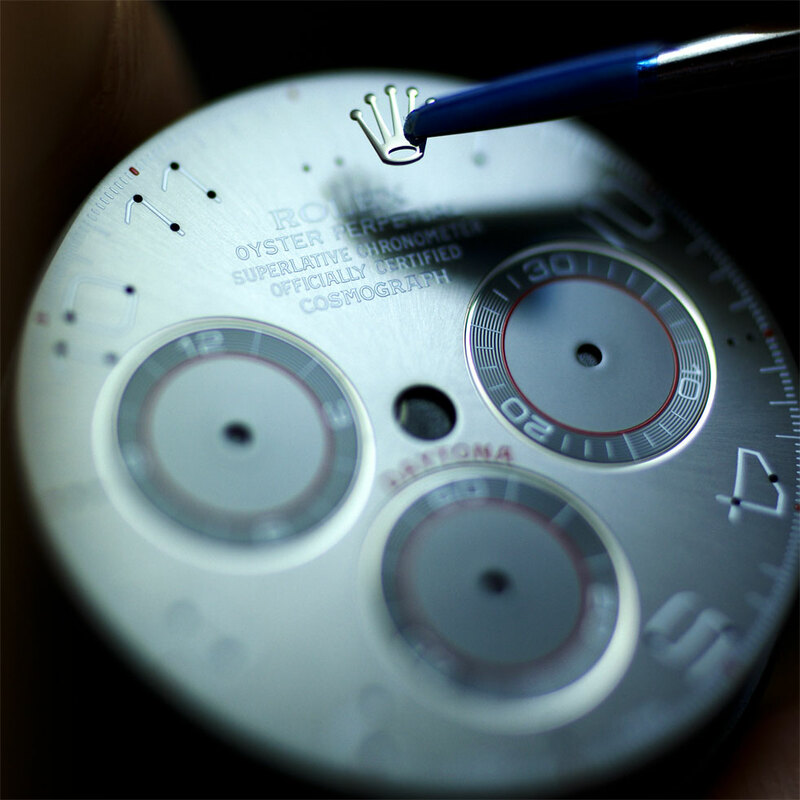 All Rolex markers and indices are applied and riveted by hand, as seen below. 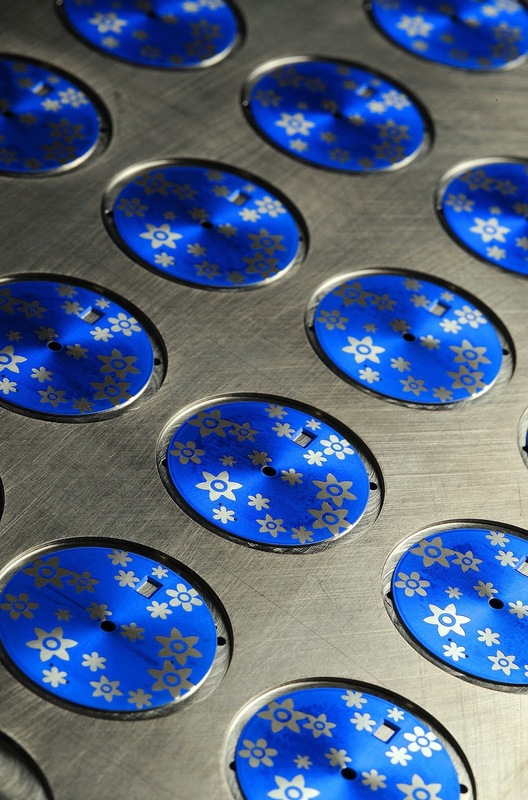 All dials are individually and carefully drop-tested to ensure markers and indices are securely attached to remain in-place for a lifetime. The Rolex facility in Chêne-Bourg workshops also specialize is inserting precious stones onto dials and on bezels as seen below. Rolex briefed us on their approach to precious stones, and they talked about the 4"C"s, which are the only considerations, which are Cut, Color, Clarity and Carrots. Rolex's Gem Setting Department really took me by surprise. I have never been in a world that is sugar-coated with precious gemstones. In this department you witness many Rolex gem setters that are highly trained making Rolex magic. When we toured the Rolex gem-setting department, I was stunned with what I saw. In particular, I was in awe of the process that goes into creating the rainbow colored bezel on this ladies masterpiece Rolex Daytona in yellow gold. All gems are hand picked, and I had the opportunity to observe the process and watch the ladies in the Rolex gem-setting department actually pick the stones for this bezel and it was mesmerizing. The bezel on this watch is covered with colored sapphires, and one ruby located above the Rolex crown on the dial. The fanatical detail that goes into making certain these sapphires perfectly compliment each other was astonishing. The photo below shows a Rolex pad printing device that stamps the dial information on the dial. 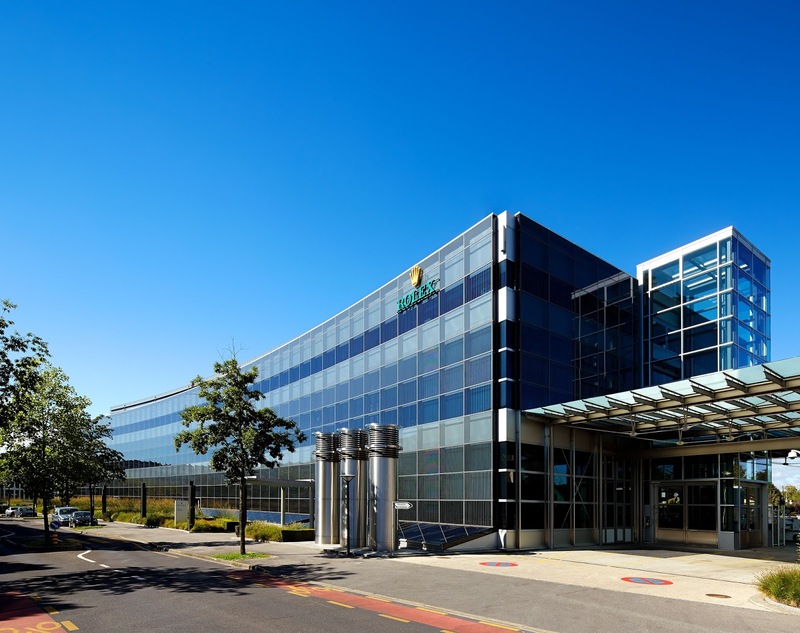 Next up we are going to explore the heart of Rolex watch-making, which is the Rolex movement making factory, located in Bienne, Switzerland. Just to put things in perspective, I would argue that if Rolex is the Mercedes-Benz of the watch-making world, then Patek Philippe is the Rolls Royce. 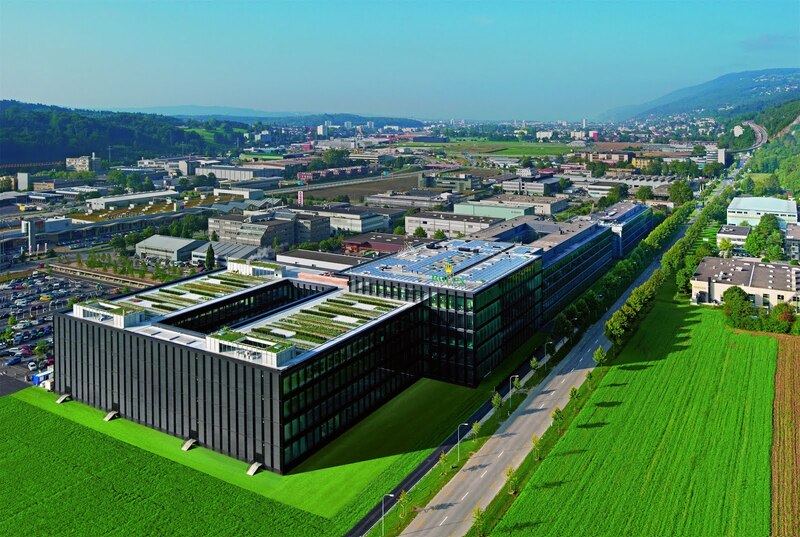 Rolex's factory that makes all their movements has always been located in Bienne, Switzerland. 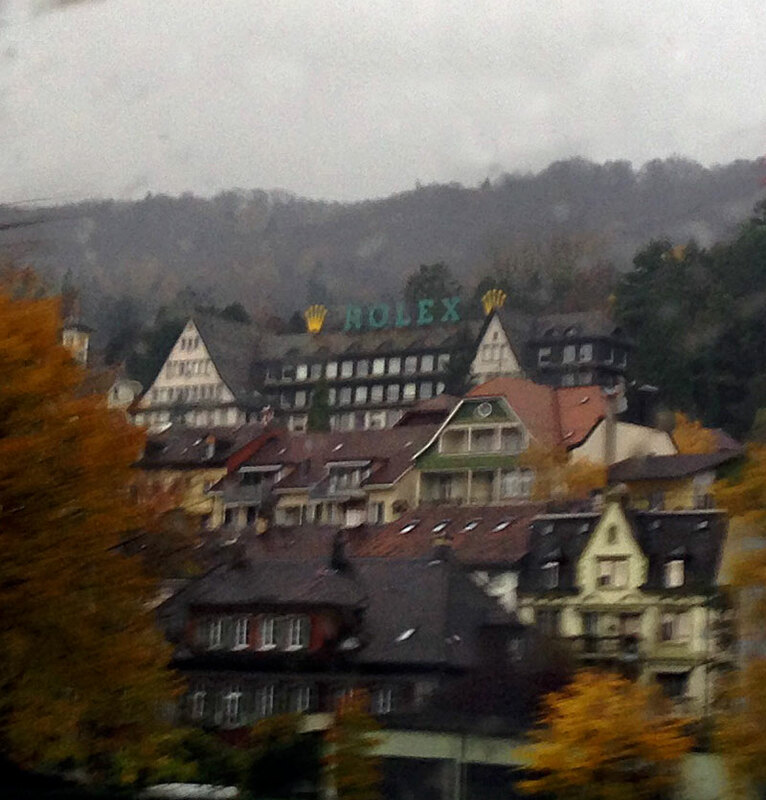 I took the photo below of one of the original (now historical) Rolex Manufacturing buildings, as we drove through the old section of Bienne, Switzerland on the way to the new Rolex movement factory, which is located on the outskirts of Bienne. 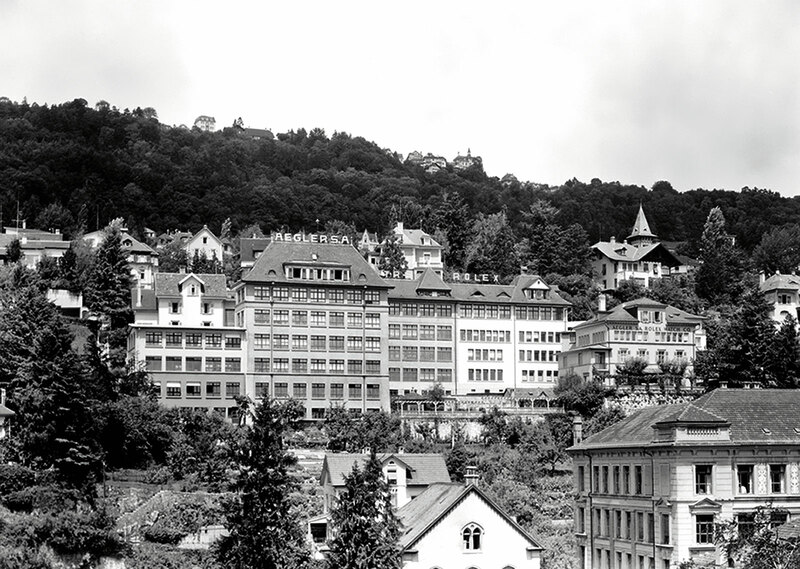 The best way to understand the significance of the Rolex factories in Bienne is to examine their profound history, as well as the man who built Rolex. 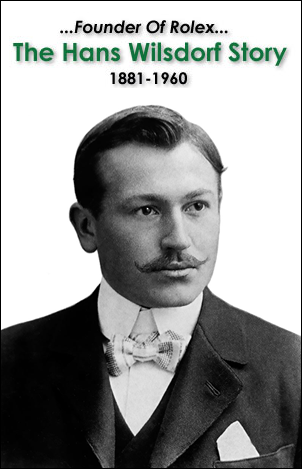 Hans Wilsdorf, the founder of Rolex originally partnered with Aegler, in 1905. 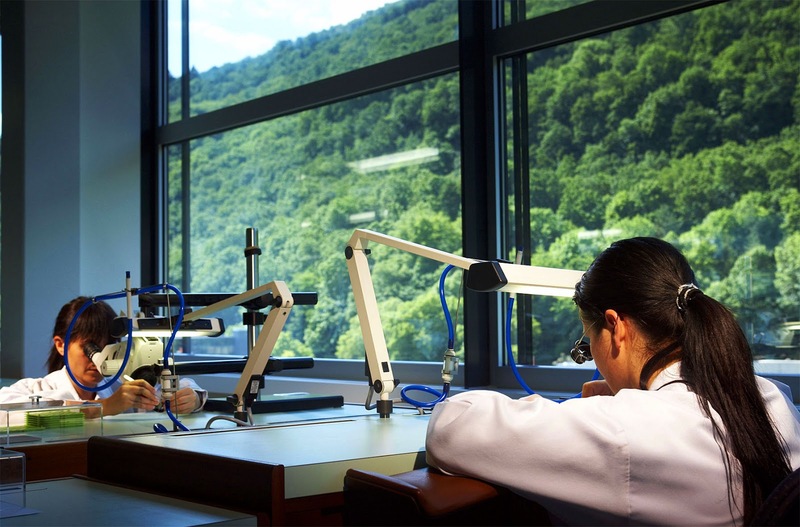 Aegler S.A. was located in Bienne, Switzerland, which specialized in making high-quality watch movements. 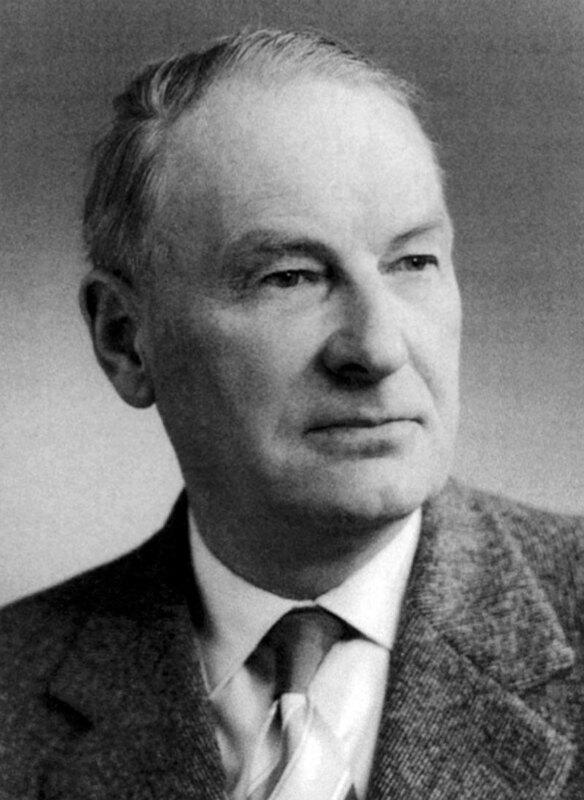 Jean Aegler, founder of Aegler S.A. is pictured below. 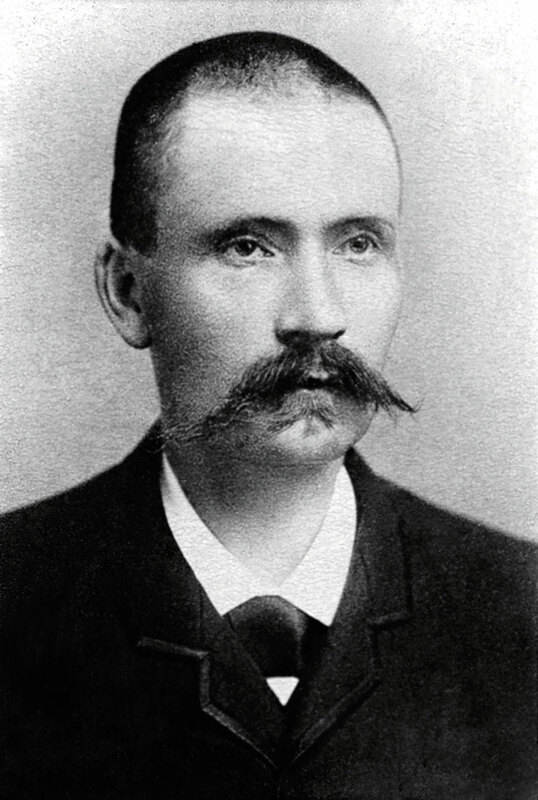 He passed away in 1891, at which time his son Hermann Aegler took over the family business. Emile Borer (pictured below) was the Chief Technical Director of Rolex in the early 1930s and is credited as being the person at Rolex who figured out how to make the first automatic movement work correctly by inventing and perfecting the modern rotor system. 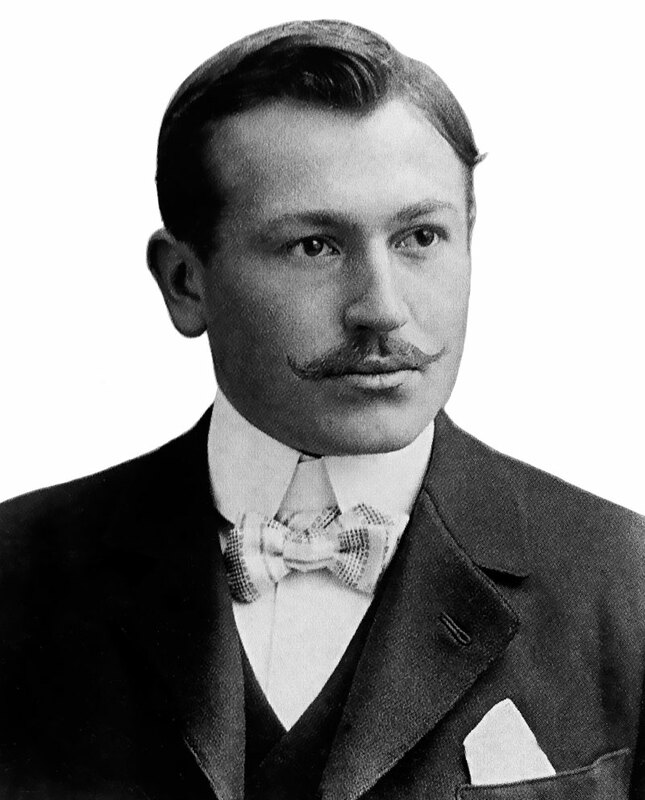 Emile Borer was the son-in-law of Jean Aegler who was the founder of Aegler Workshop, which provided Rolex with all their movements. Emile Borer joined Aegler Workshop as an engineer during World War I, and he soon become responsible for developing new technology. 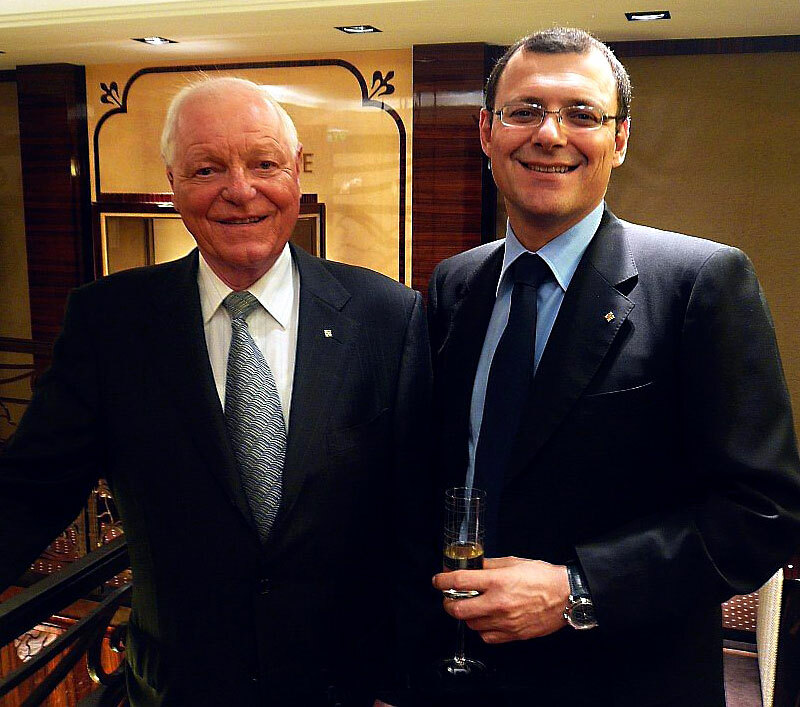 In 1944, Emile Borer became the General Manager of the Aegler Workshop, which remained the primary supplier of Rolex movements until Rolex purchased Aegler Workshops in 2004, under the leadership of Patrick Heiniger. In 1931 Rolex patented the Perpetual rotor which automatically wound the watch, thus eliminating the need to ever wind it again!!! This not only made it more convenient, but also more accurate because the watch would never stop so long as you wore it. 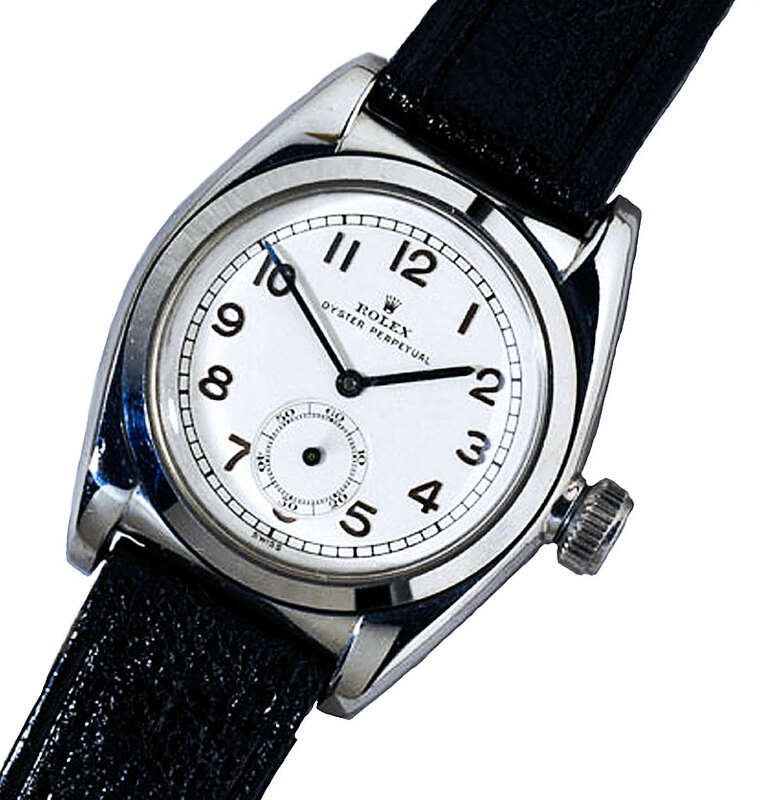 The Rolex Oyster Perpetual watch pictured pictured above and below was made in 1931 and Rolex put an exhibition caseback on it to easily show potential consumers how it worked. As you can see in the photo below there is a rotor that says, "Rolex Auto Rotor", which automatically spins clockwise or counter-clockwise just from the movement of your wrist, thus "Automatically" winding the mainspring. 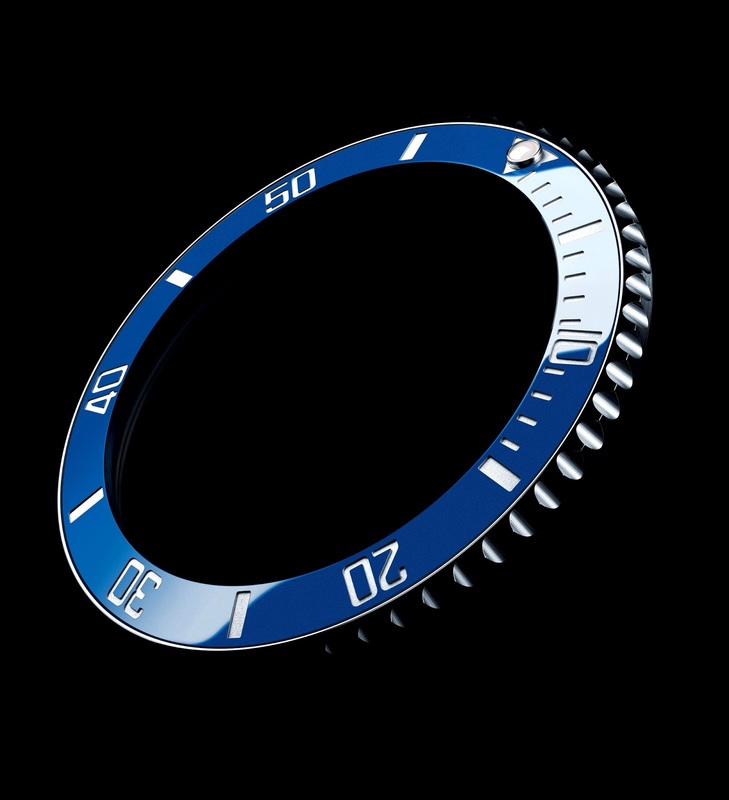 In other words, even the slightest movement of your wrist (using gravity) will continually wind the watch, thus maintaining the mainspring at optimum tension without overwinding it, thus storing the power generated. By creating an auto-winding, or self-winding wristwatch, Rolex once again revolutionized the watch–and again, Rolex was not the first to explore creating a self-winding watch, but Hans Wilsdorf and Rolex were the first to perfect it, patent, and bring it successfully to market. 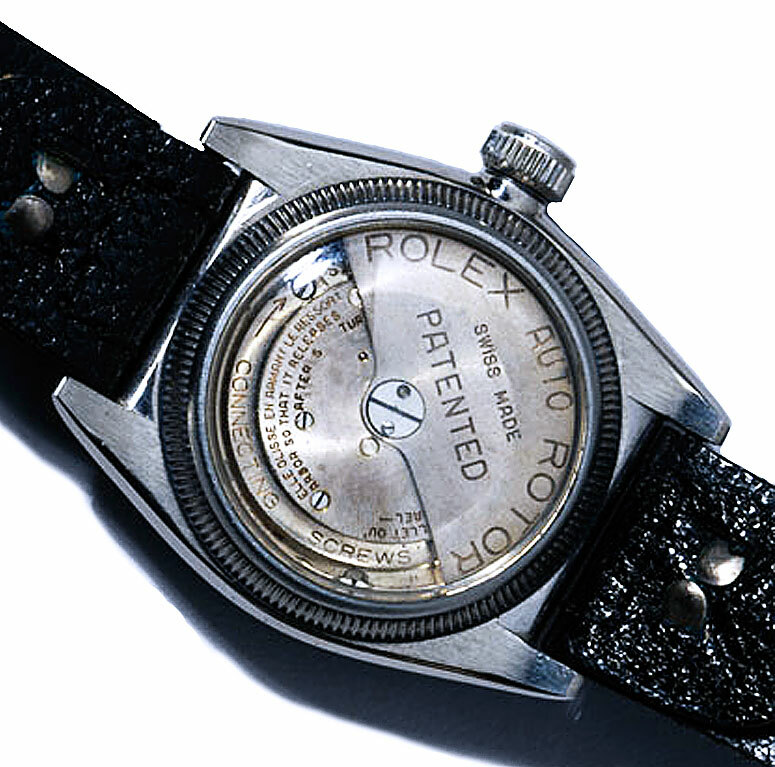 The Rolex Caliber 1500 ended up being a work-horse movement and was used by Rolex in watches up until 1990. It is fascinating to see the draftsman had to stand up and draw a movement. The Rolex Caliber 1500 was the first Rolex movement that instantly changed the date. 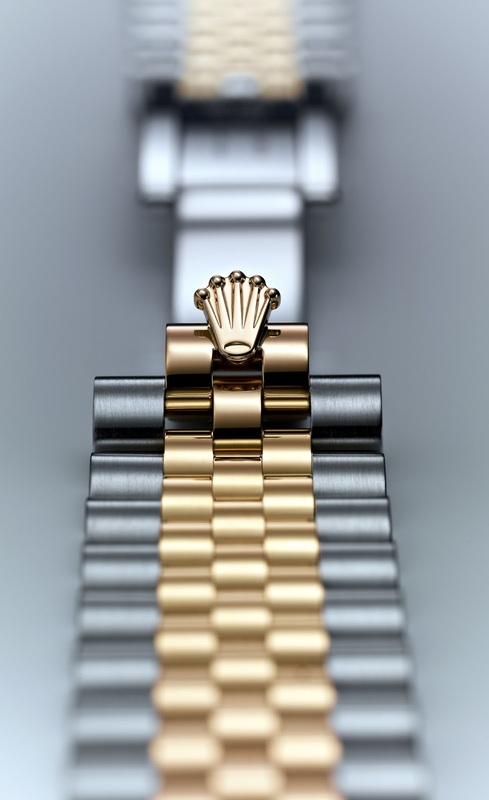 Rolex began replacing the Caliber 1500 in 1977 with the Caliber 3035. The Caliber 3135 Rolex movement eventually began replacing the Caliber 3035 in 1988. 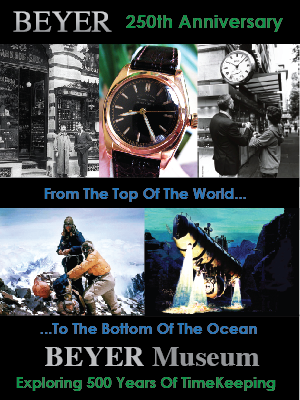 For many decades, Aegler grew in unison as Rolex grew and they continued as the primary supplier for Rolex movements. 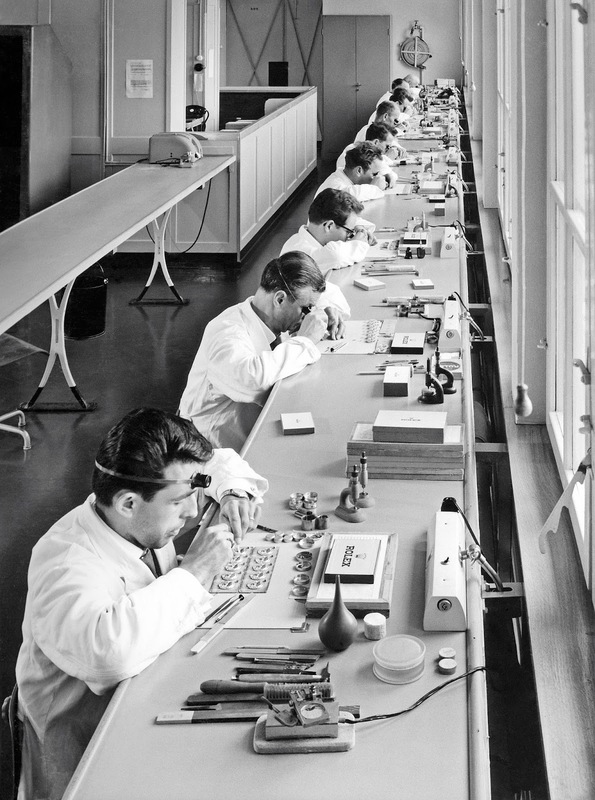 This next rare vintage photo shows Aegler watchmakers making Rolex movements in the Aegler facility in Bienne, Switzeraland in 1955. 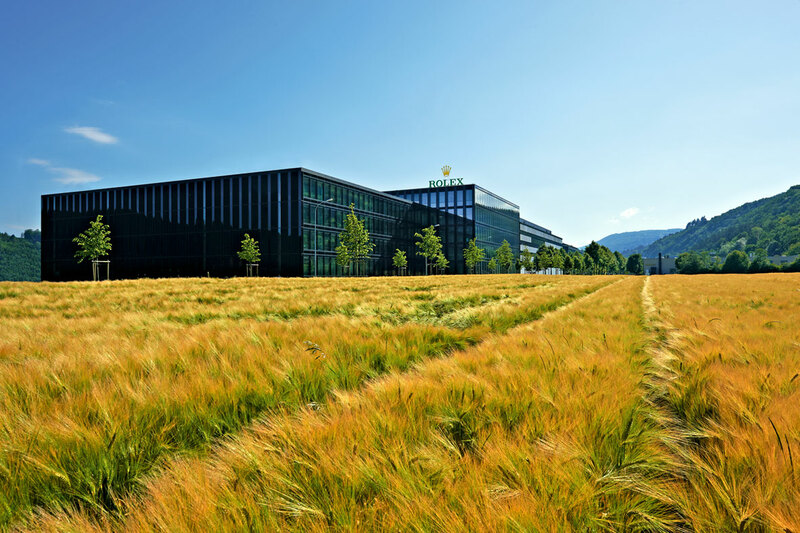 When we arrived at the Rolex Bienne campus, we were greeted by the director, and his full team of executives who run the facility. 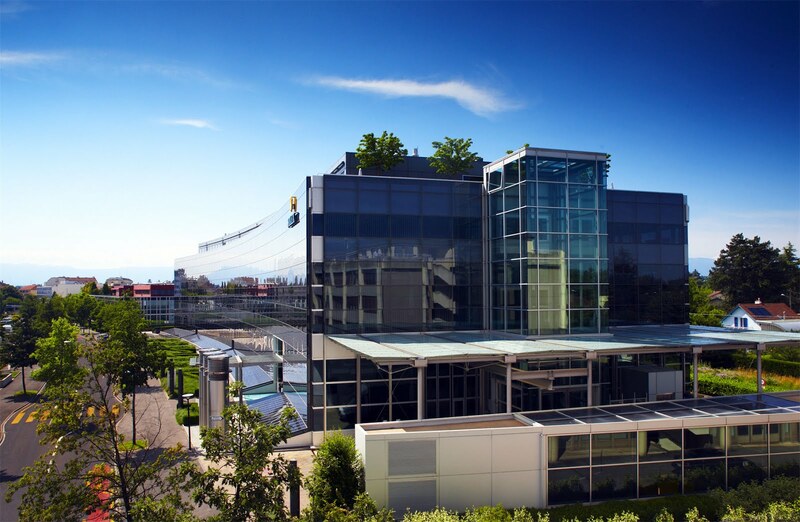 Most of the executives at the Rolex Bienne facility had Italian accents. Switzerland is basically broken-up into three sections, and in Geneva, the primary language is French, and in Bienne, the primary language is Italian, and in Zurich, the primary language is German. The executive team were over-the-top passionate about showcasing their amazing factory, and they treated us like VIPs. I think this is because the Bienne Rolex movement factory is the least visited Rolex factory, since it is located 100 Miles (161KM) North East of Geneva, Swizerland. It took almost two hours to travel to Bienne, which is also know as Biel, Switzerland. Before we began our tour, we were briefed by the Director of the Rolex Bienne facility, who was wearing a 42mm Rolex Explorer II, with the Orange 24 hour hand, and Polar white dial. I said to him, "I love your watch. It is really cool looking." He respond by saying, "It is not a watch. It is a Rolex!" I smiled and responded: "You must have gotten that line from André Heiniger!" He smiled back at me and winked. Once again, I felt like I was meeting family members from the old-country, which was fascinating and heartwarming at the same time. I mean we were perfect strangers that shared a complete passion for Rolex design perfection. 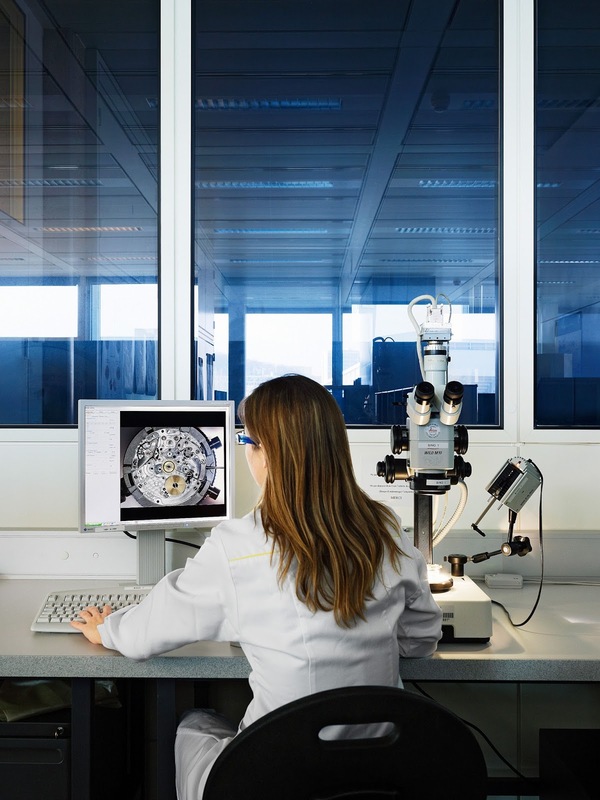 This following photos were all taken on site at Rolex's recently built Building 7 located in Bienne, Switzerland where all the Rolex movements are made. 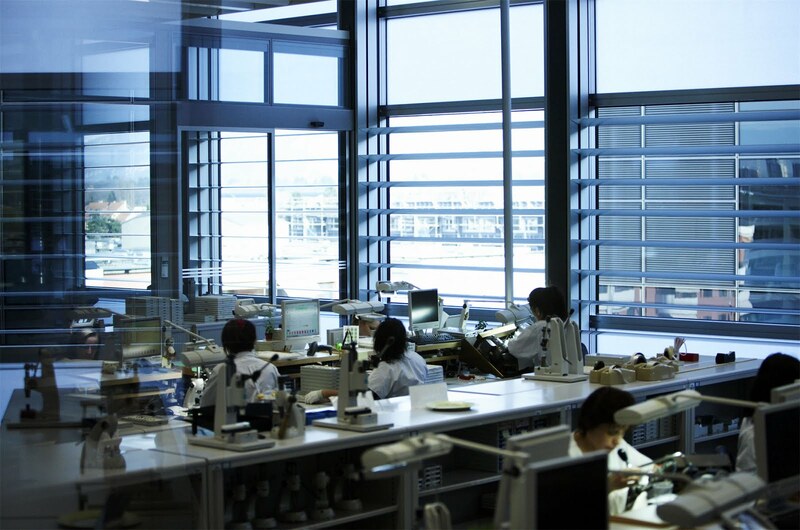 This all-new Rolex factory campus began construction in 2009. It was designed to be extremely efficient and comfortable. The two photos below show how the skylights flood the building with natural light all-day long. This first image shows the circular skylights in the roof, which are not only lighting the top floor, but sending significant amounts of light down to the lower floors through the large light-well holes, as seen on the bottom right side of the photo below. 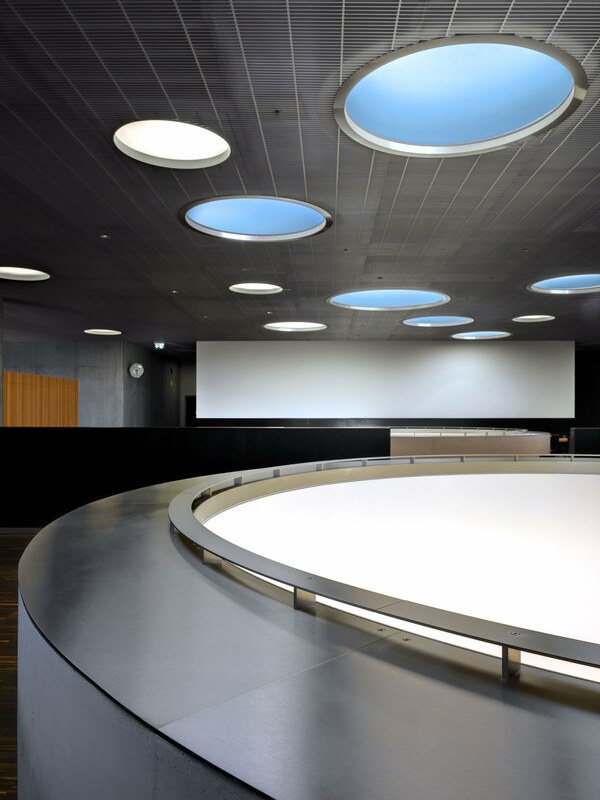 I have never seen such remarkable architectural details like skylight/skywell system located in the Rolex Bienne factory. As you can see in the photo below, the natural outside light floods in through the roof, and continues through all four floors, to flood the entire structure with natural light. We all just stood in complete awe of this magnificent design!!! 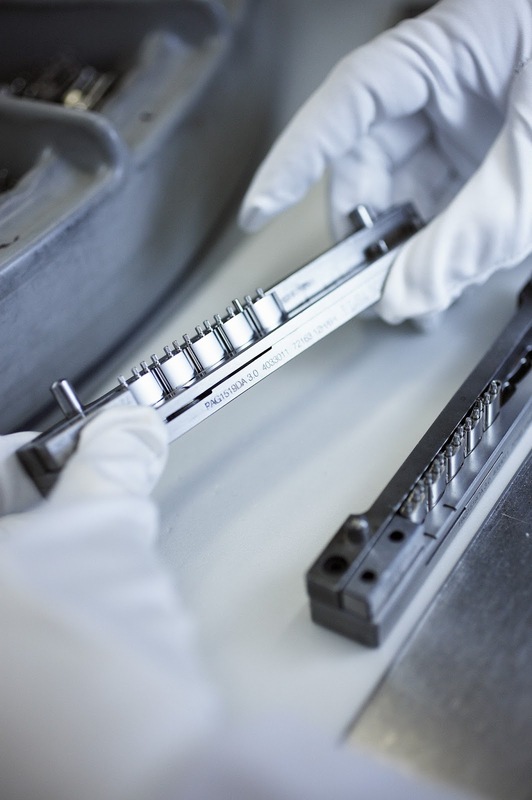 All movement parts, from hairsprings to mainplates, are made in Bienne. 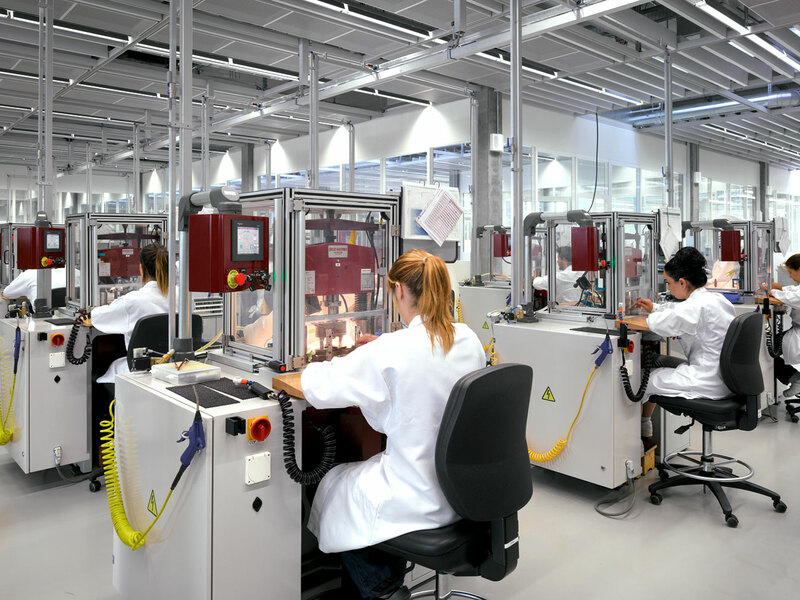 Rolex does not publish their annual production output, but it is estimated approximately 2000 employees produce 50 million movement components annually–which end up in more than 799,000 Rolex automatic movements assembled per year in Bienne. 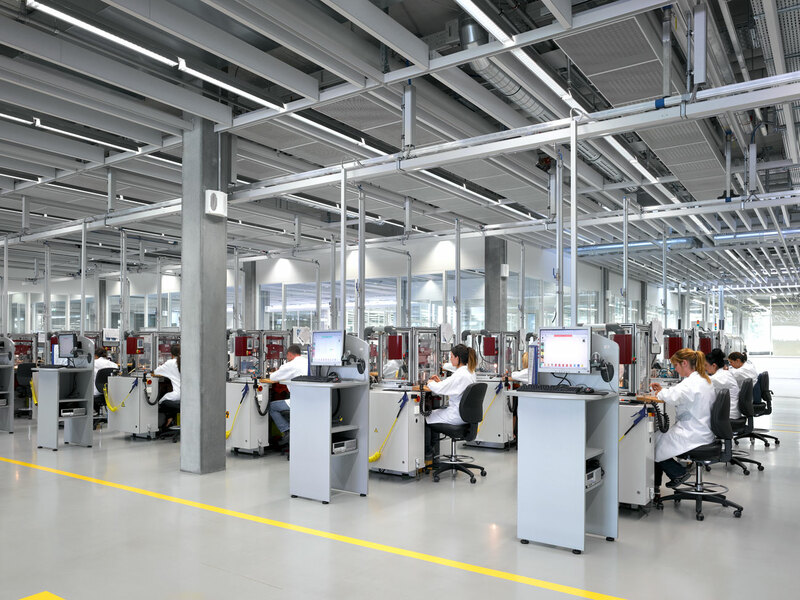 In the photos above and below, we see Rolex watchmakers in the Bienne facility working on assembling and testing the movements. There are very large windows located on the sides of the building, which allows a great deal of natural light to flood the floors that house the watchmakers. 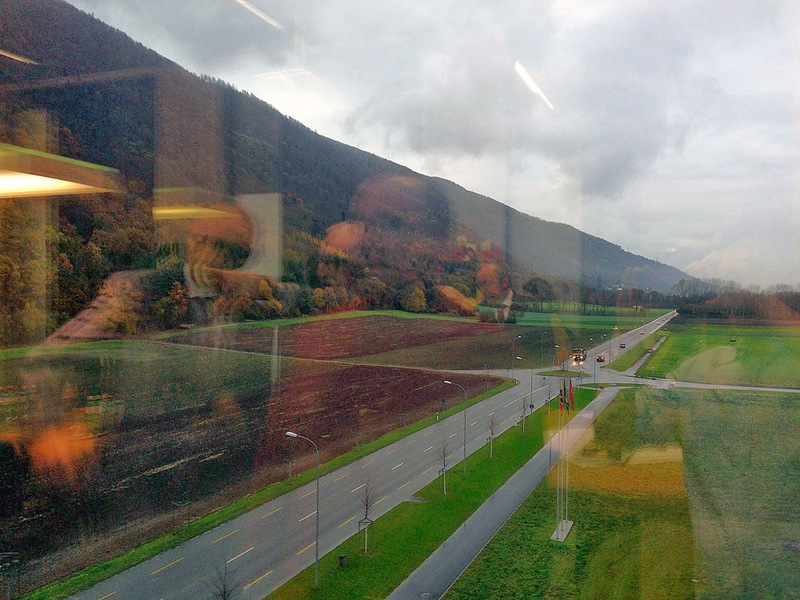 In the photo below taken in the Bienne factory you can see just how stunningly beautiful the location is, and all windows have a great view of the lush green Jura mountains, which is very Zen-like. 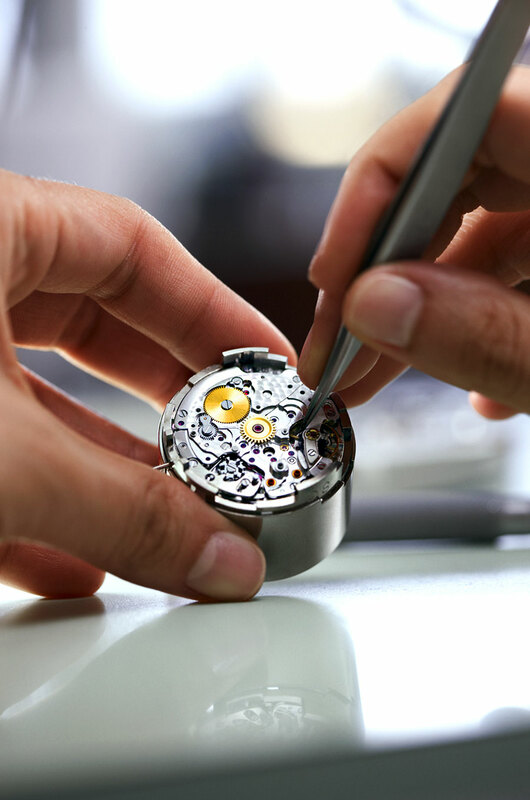 In the photo below, we see see a Rolex watchmaker assembling a Rolex movement. Being a watchmaker requires a special type of personality that requires much patience and precision. 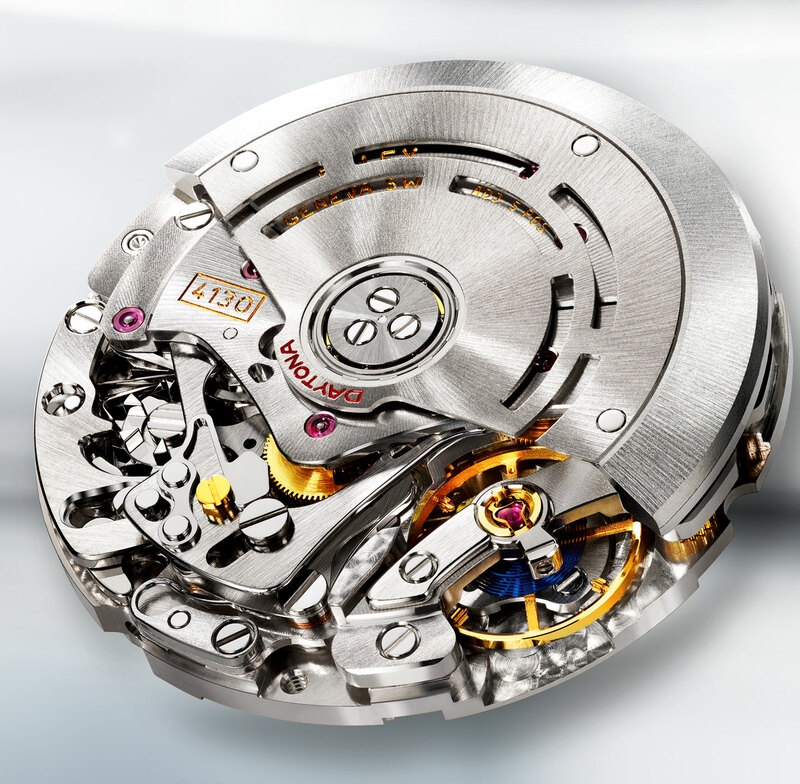 The Rolex Parachrom hairspring is an absolute work-of-art, in-and-of-itself. 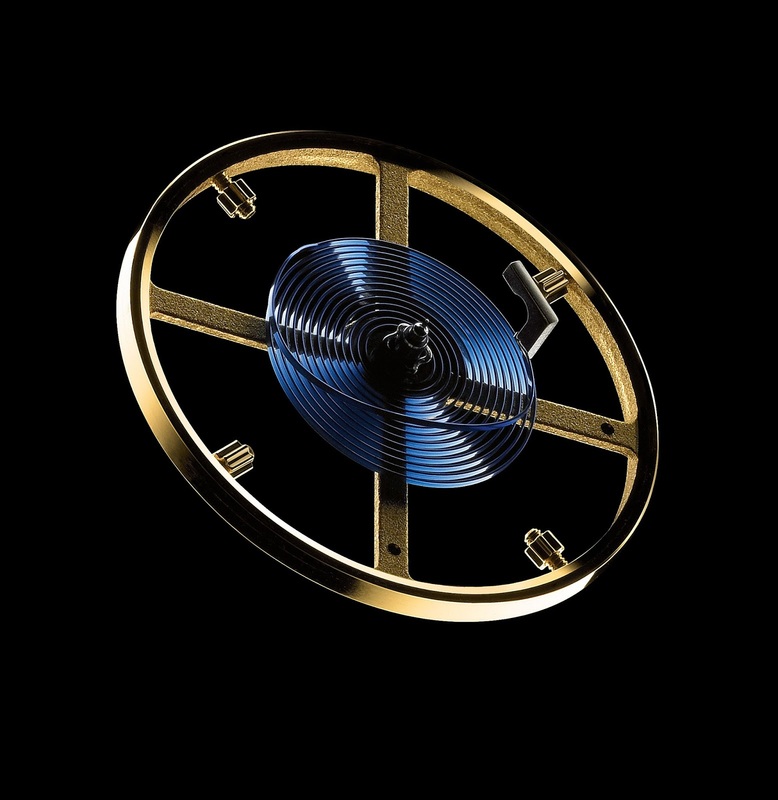 Rolex makes their own proprietary hairsprings which have a special name for their steeled blue colored hairspring, which Rolex refers to as a "Parachrom Hairspring." 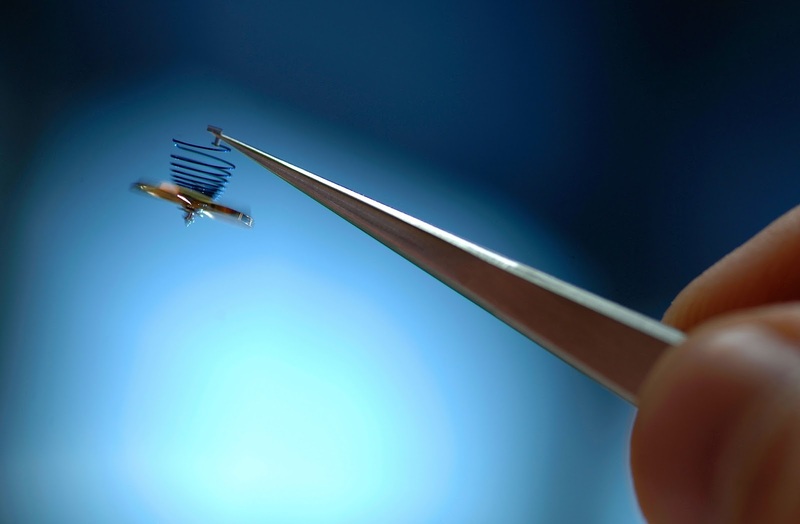 The hairspring is named a hairspring, since the coiled strand of metal it is made from is as fine as a human hair. The Hairspring is the heart of any mechanical watch as it oscillates at a certain frequency, which regulates the accuracy of the precision of timekeeping. So just to be clear, in the photo below, the blue coil is the hairspring, which is attached to the gold balance wheel. If a balance wheel is not perfectly balanced, it would have a negative effect on the precision of timekeeping, so very fine watches have four separate balance adjustment weights, which can be adjusted to make certain the balance wheel is always perfectly balanced. Every Rolex hairspring made features these balance wheel micro-adjusters, as you can see in the photos above and below. 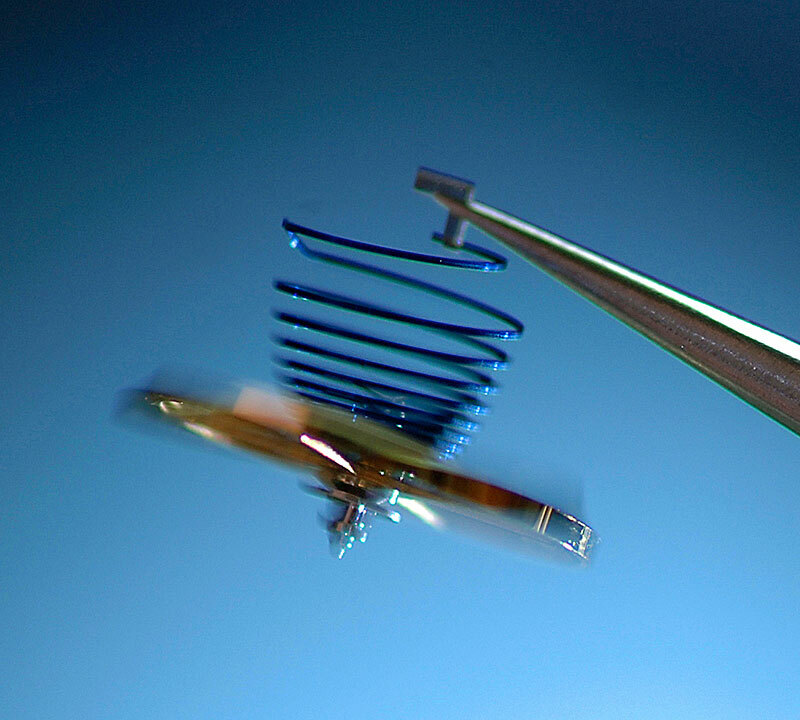 Rolex hairsprings also incorporate a Breguet overcoil which is attached to the end of the hairspring. 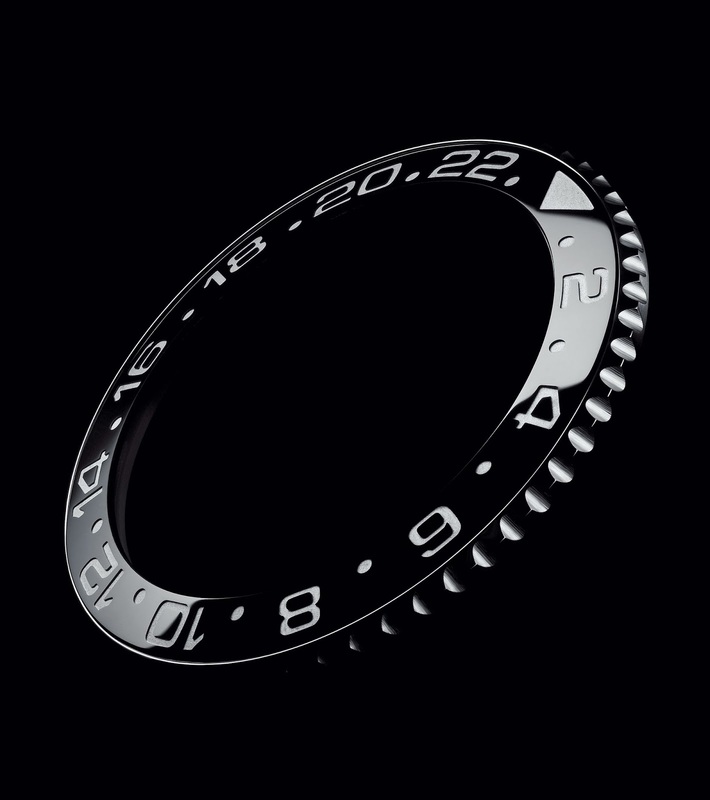 Rolex hairsprings are extremely precise and sturdy, and anti-magnetic. 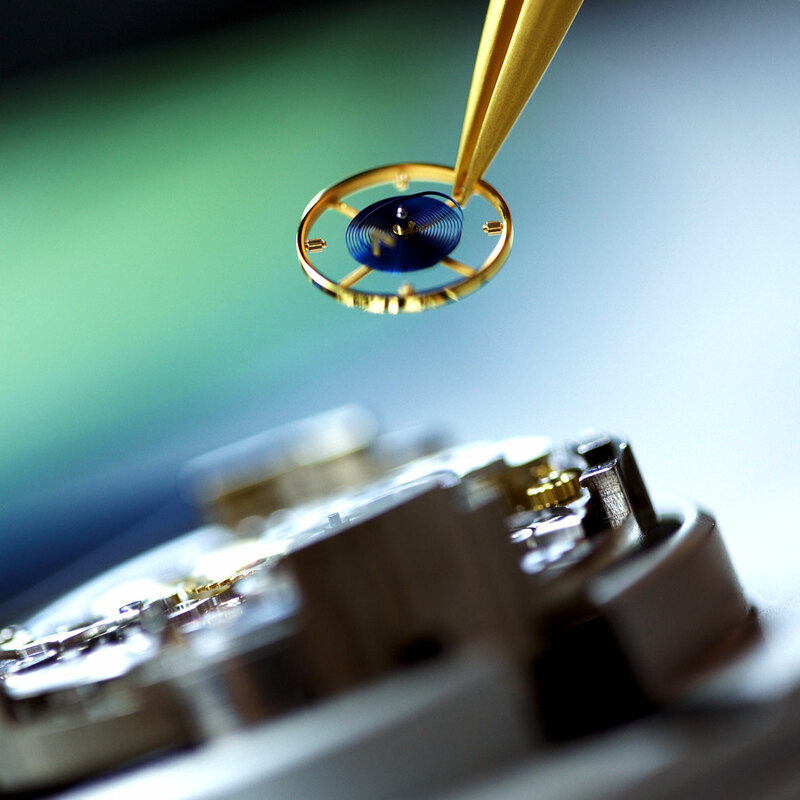 Below is a Rolex video that shows how these amazing Parachrom Hairspring's are made. On the tour, we saw the proprietary Rolex Fusion Furnace used to make the Parachrom hairspring material. We had an over-the-top passionate Rolex scientist try and explain to us how this machine worked, and I will do my best to share this with you. 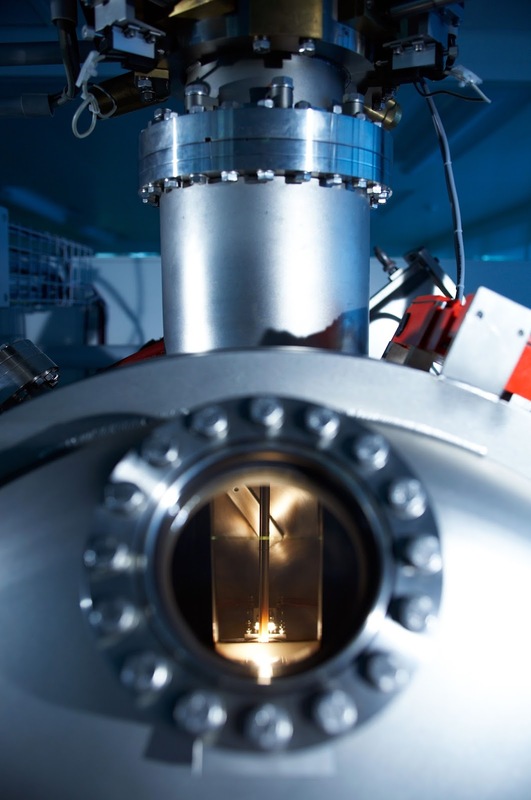 The photo below shows the machine itself, and he invited us to look in the circular hole, but first we had to put on special ultra-dark glasses, because the fusion furnace was so bright. The photo below shows exactly what we saw when we looked into the machine. 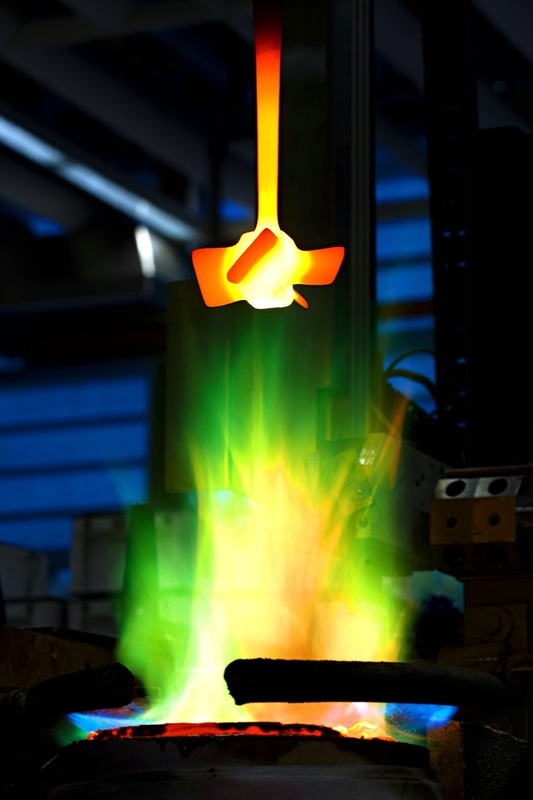 We were told the furnace was so hot at 4892 degrees Fahrenheit (2700 degrees Celsius), it caused the alloy to glow as bright as the sun. The other crazy thing was that in order for the alloy to remain perfect it could not touch anything after it was made, so if you examine the photo below, you will see there are two rods that seem to be hanging down. 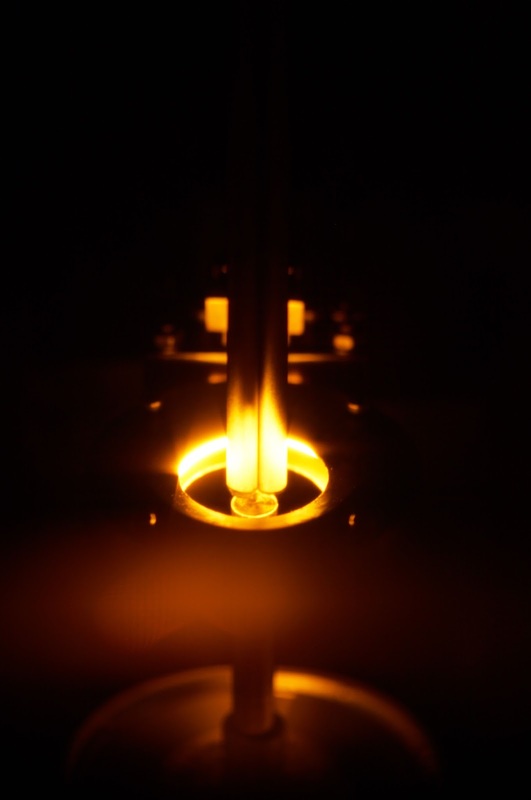 Those two glowing rods are the special alloy material, and they are being suspended so they don't touch anything. Next Rolex showed us how they covert these rods into hairspring material that is as thick as a human hair. The whole thing was completely mind-boggling and impressive. Rolex is probably one of the few watch manufacturers that make their own hairsprings, if not the only one. 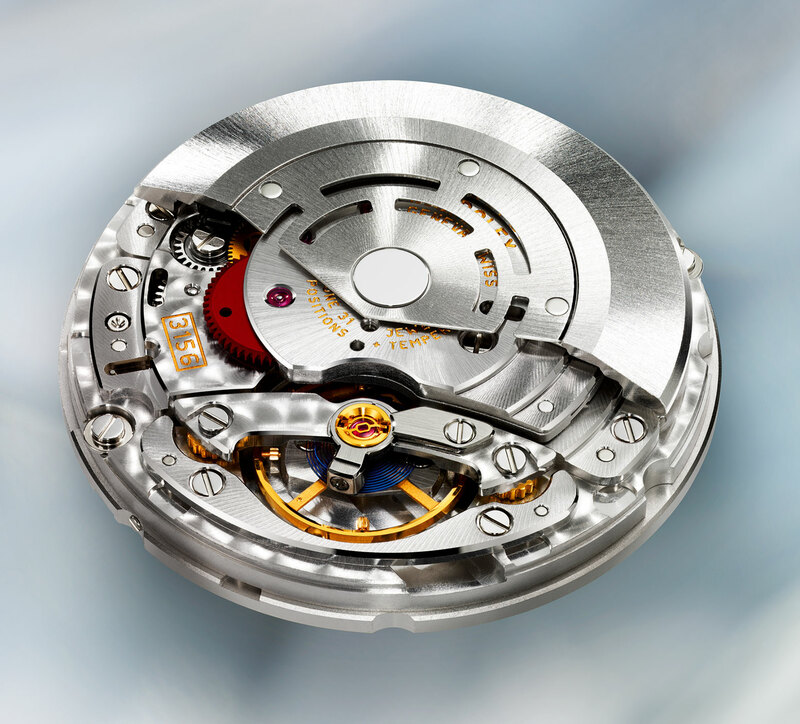 The watch movement is arguably the heart of the watch, and Rolex's Bienne makes 100% of the components for their movements here. Rolex watch movements range in complexity from having somewhere between 200 and 400 components, all of which are made in Bienne. The world or Rolex movement making is a miniature world governed by micro-technology, and micro-mechanics. 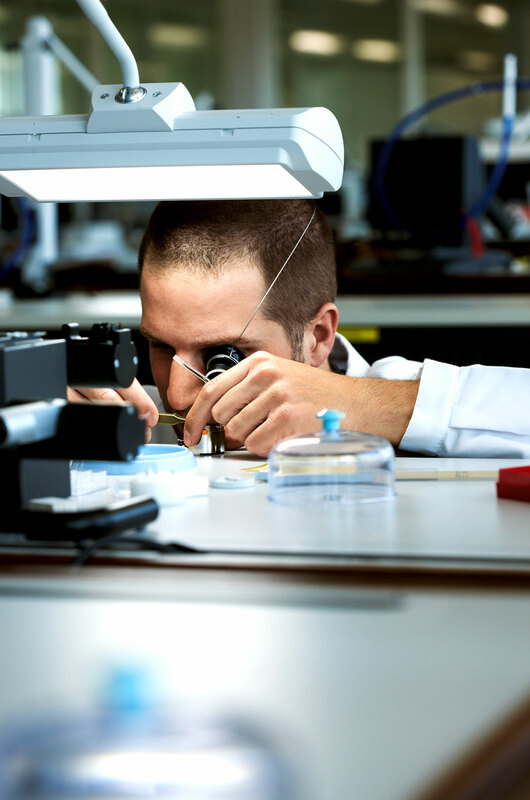 In this micro world, quality is the-name-of-the-game, and critical tolerances are measured in microns and sub-microns. Rolex movements are not not finished to look really fancy or pretty, but in many ways they have a natural beauty to them, like a naturally gorgeous woman who does not need to wear make-up. 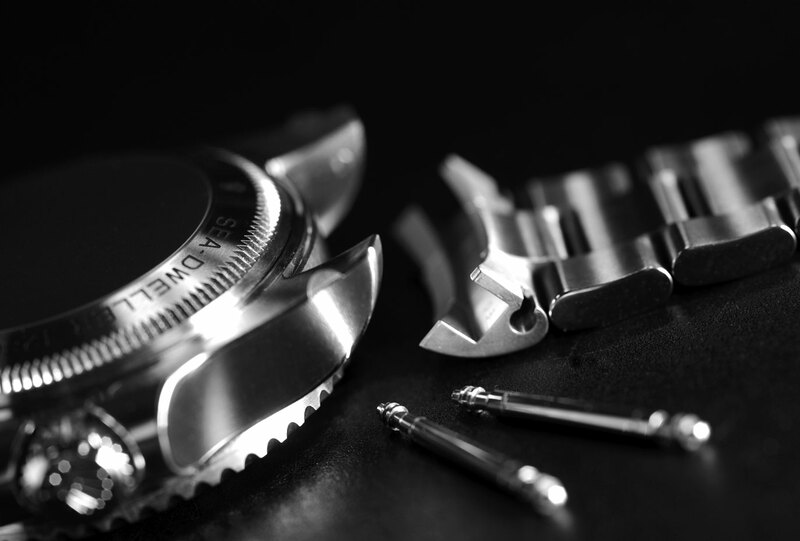 Rolex movements, no matter how complicated, are known for being as simple as possible, and for being strong, reliable work horses, and watchmakers love them because they are relatively easy to work on. 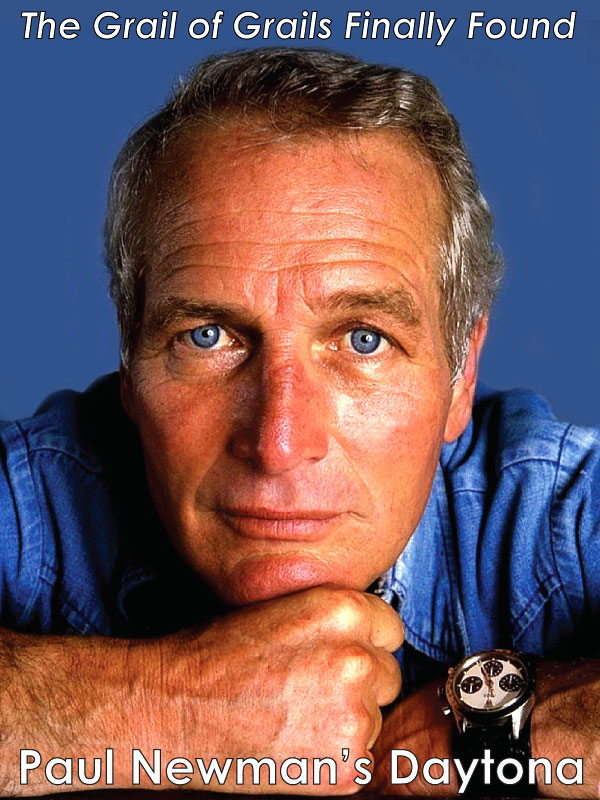 In the photo below, we see a Rolex Daytona movement. Rolex movements have to be really reliable in order to pass the testing process of the Swiss Official Chronometer Testing Institute (COSC), and as such are subjected to 15 days and nights of rigorous extreme testing to make certain they are bulletproof. The four of us posed for the photo below after we finished our tour of the Bienne manufactory. We were all pretty exhausted from the constant deluge of stimulation and information we were exposed to, and at the same time were all kind of naturally high from the experience. After we finished the tour, we traveled to a board room where Rolex hosted a special cocktail reception for us, with Champagne and Hors d'oeuvre. The reception was held in on one of the top floors located just under the Rolex sign in the photo below. In noticed when we were all looking out the window at the cocktail reception that since it was so cloudy outside, we could all see our reflection in the window, so I asked Ariel Adams if he would take a photo of everybody in the window, which he obliged upon. So in the photo below if you look closely you will notice Ariel on the right side of the photo, and I am in the middle with the maroon turtle neck, and James Dowling is on my left pointing out the window at the magnificently beautiful Jura mountain range. 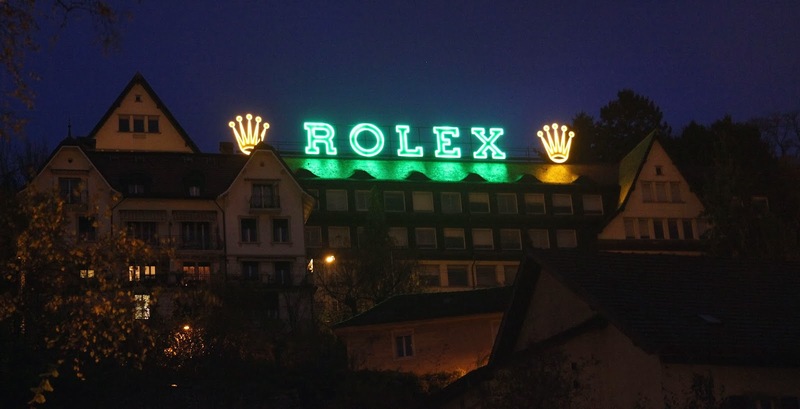 On the way back to Geneva, I asked the driver to take a detour so we could drive up the hill in old-Bienne to go and check out the original Rolex movement manufacturing facility, so I could take a photo of it with its ROLEX sign lit up, which you see below. This capped-off one of the most fascinating experiences I have ever had in my life! At Rolex I expriened a very deep sense of caring, and absolute lack of carelessness, coupled with a very strong sense of mission, wrapped in passion and deep enthusiasm. Rolex is absolutely obsessed and fanaticall with achieving excellence in everything they do. Everything at the Rolex Manufactory is designed just like a timeless Rolex watch which is built-to-last, and stand the true test of time. 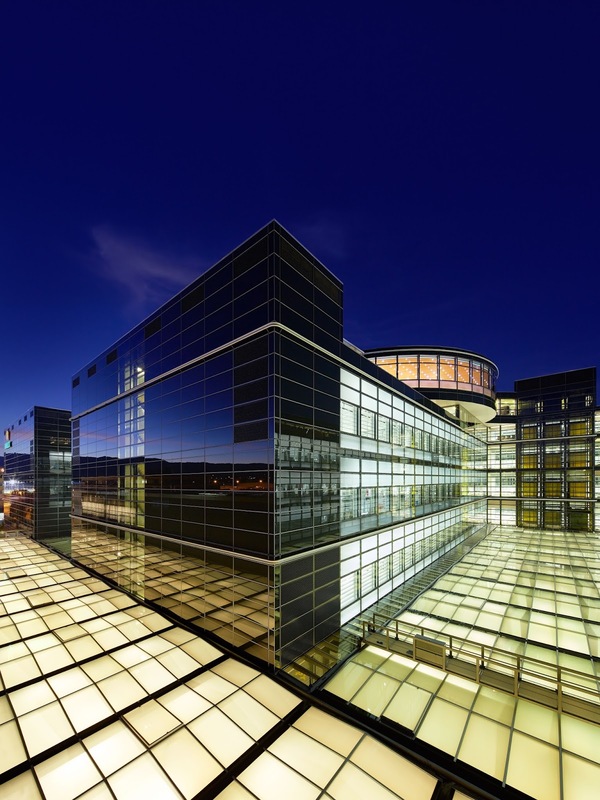 In my opinion, Hans Wilsdorf flawlessly executed a business plan and ultra-long-term strategy. He remains one of the most ideal entrepreneurs in history by leaving behind a company with the Utmost Integrity, coupled with a highly inspirational drive to be the best in the world. It was strange, during my whole tour, I kept asking myself, who is really running Rolex today? Who and what is the driving force behind Rolex today, and I clearly discovered it is the spirit of Hans Wilsdorf, which he left behind as the cornerstone of Rolex culture. This enduring spirit stands testament to human perseverance and ingenuity. 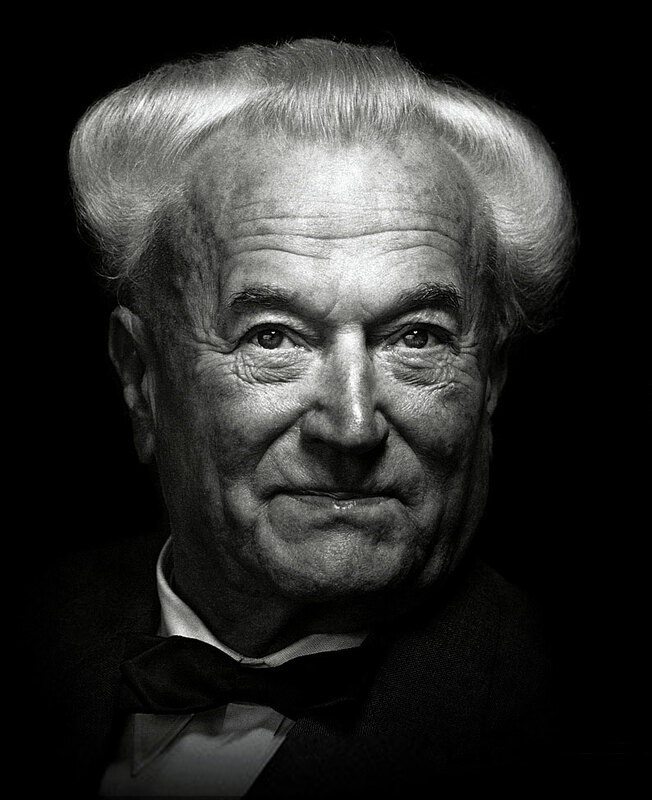 Hans Wilsdorf was a supreme risk-taker, and innovator, who never rested on his laurels. Hans Wilsdorf's enigmatic soul still pervades everything Rolex to this day, and he remains The Ghost In The Rolex Machine. Rolex came purely from Hans Wilsdorf's imagination, and understanding what truly makes Rolex tick is something that until this story was written, has defied explanation. 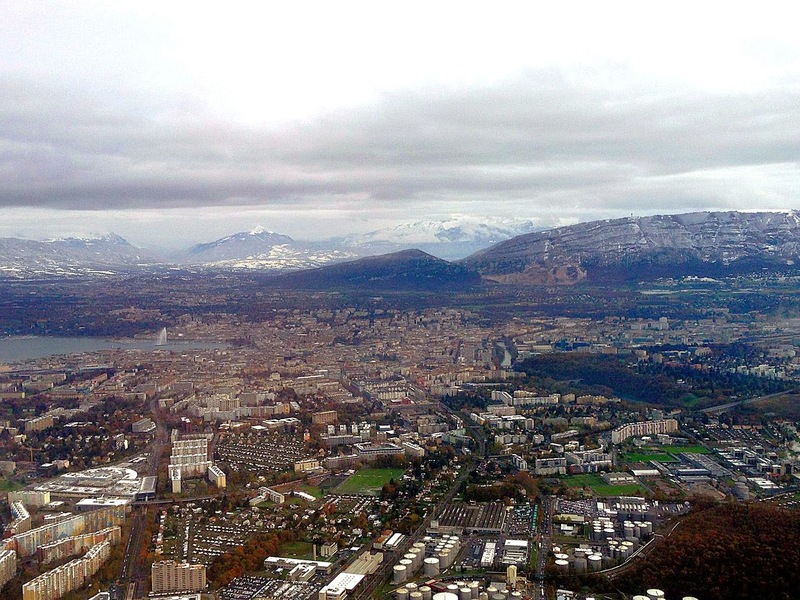 I took the photo below from above Geneva, Switzerland as I headed back home to San Francisco, California. The time I spent touring Rolex headquarters and all four Rolex manufacturing facilities are memories I will cherish for the rest of my life! My tour through Rolex was probably the most mentally and intellectually stimulating experience I have ever had in my life. I say this because from the very beginning to the very end of the tour, I was constantly bombarded with incredible amounts of really deep information, and tremendous intellectual stimulation from my fellow online publishers, as well as the folks at Rolex. I was so overwhelmed with information and visual stimulation, that by the time I left Geneva, I was still intellectually downloading and had not even really begun processing. It took me a few good weeks to really mentally process all the magnificence and splendor of what I discovered and witnessed first-hand inside Rolex. My entire life I have had many, many opportunities to experience different professional environments, but I have never witnessed and experienced anything as ultra-proffesional, otherworldly and timeless as the world of Rolex. 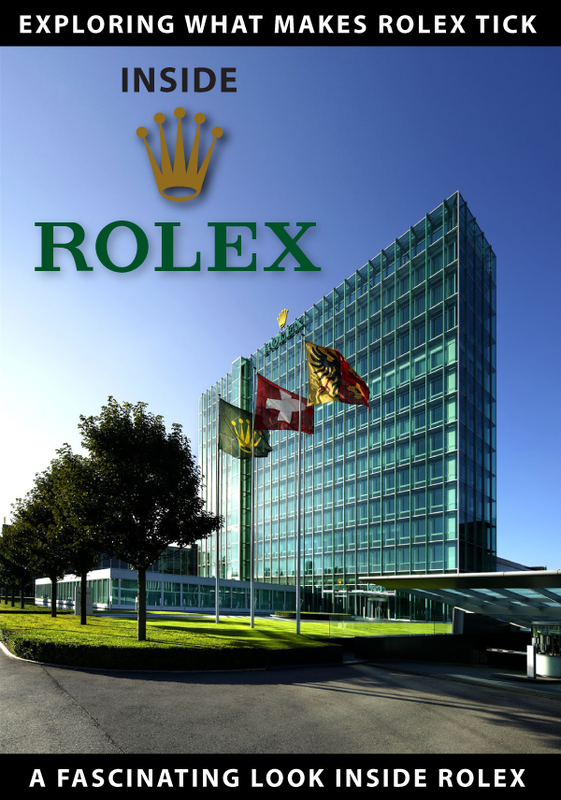 Touring Rolex in Geneva, Switzerland was a deeply awe-inspiring and spiritually uplifting experience. It is also crystal-clear to me as a student of Rolex history, that Rolex never competed externally, and never tried to compete with any other watch brand, but instead constantly competed with itself in its internal quest to achieve genuine excellence, and therein lies Rolex's greatest future challenge. So what is my final conclusion? If the rest of the world ran like Rolex, the world would be a much better place. Rolex is not only superlative, it is unequivocal and highly sublime. 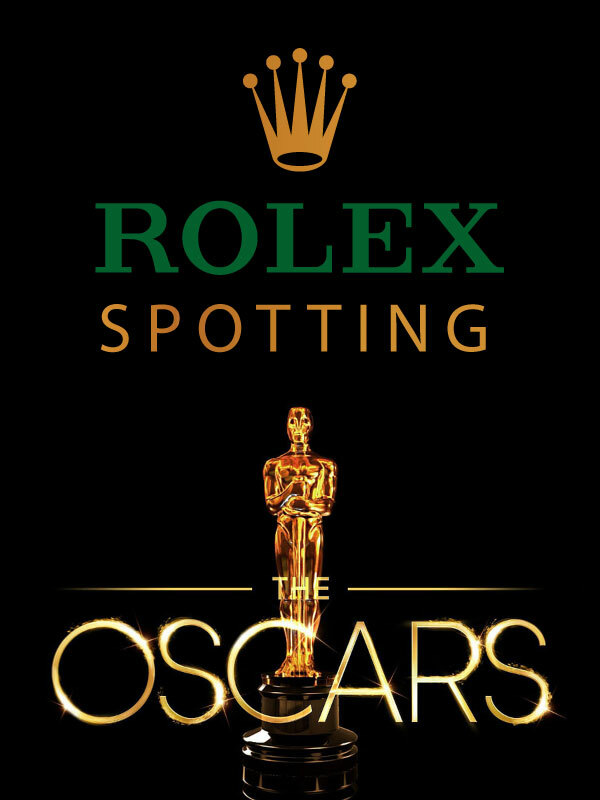 Thus, it is no coincidence that Rolex remains the International Mark of Success and Achievement.